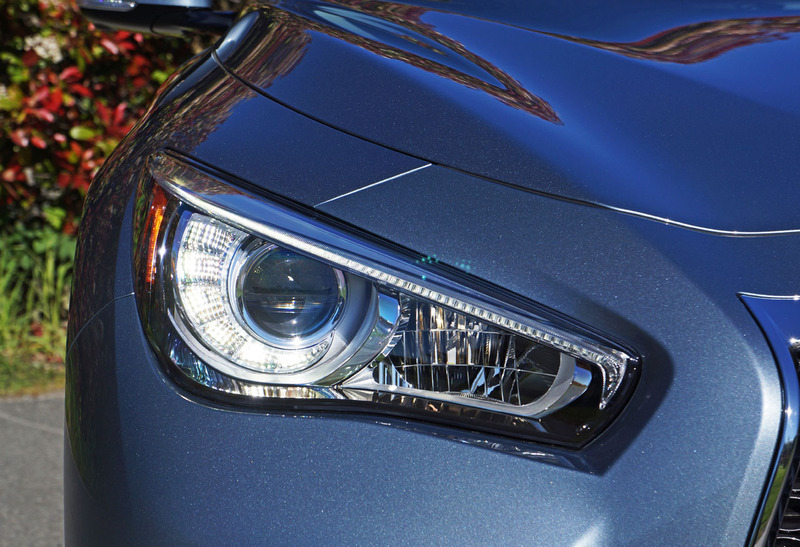 hood and it’s an entirely different story. 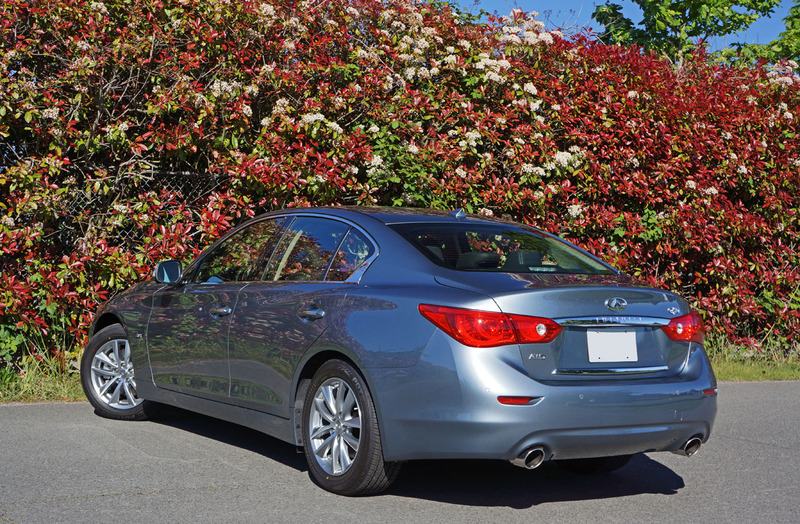 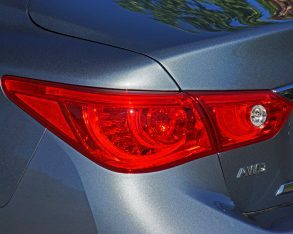 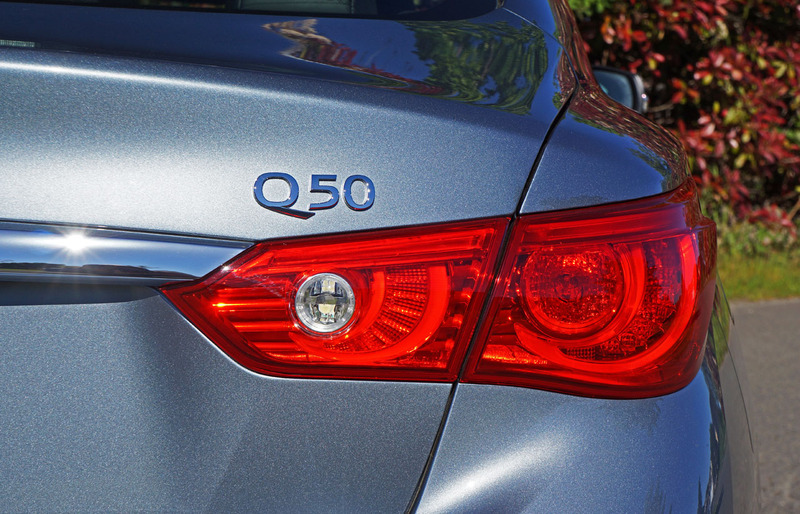 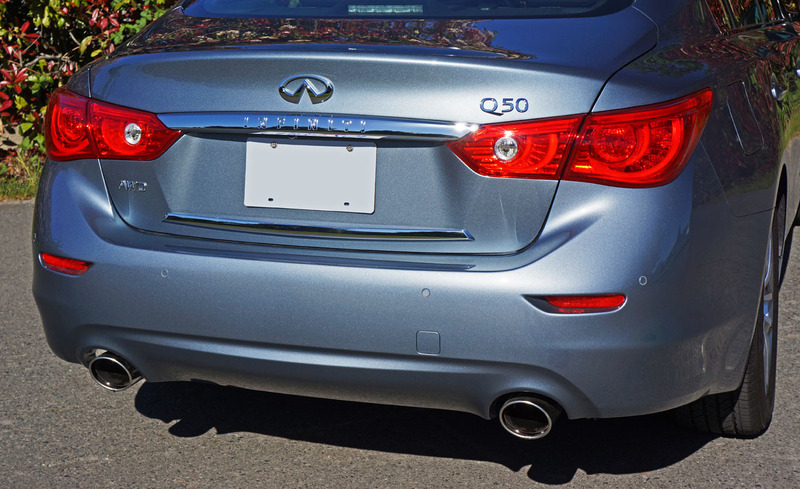 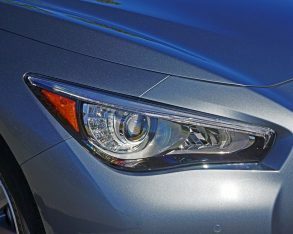 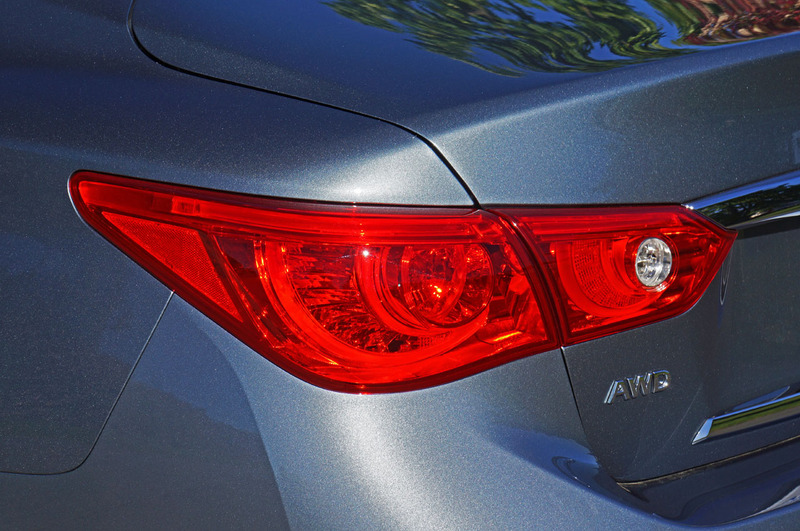 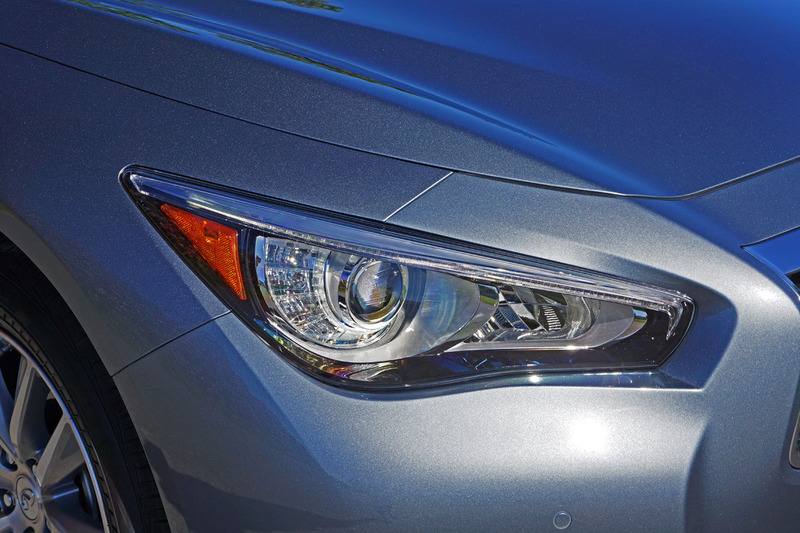 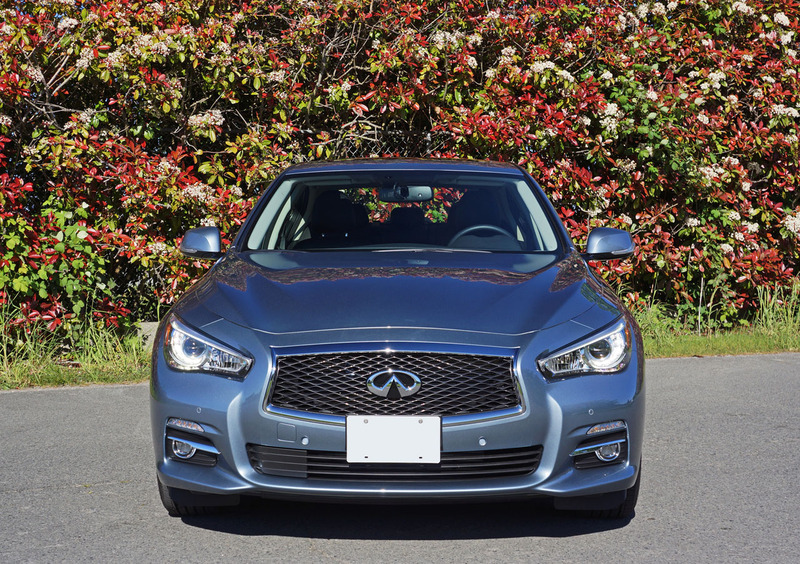 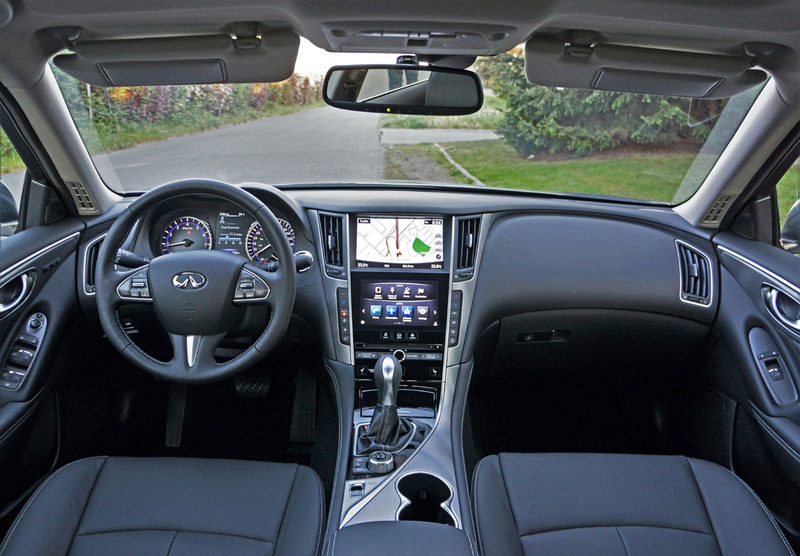 The Q50 underwent a complete redesign for 2014 at which point it left its G series past behind and took on its current Q designation, and no one is complaining about its styling. 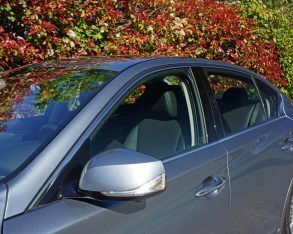 Even well into its third model year it remains one of the more attractive in its highly competitive compact D-segment luxury class, but after this latest year there are many more reasons to sit up and take notice. 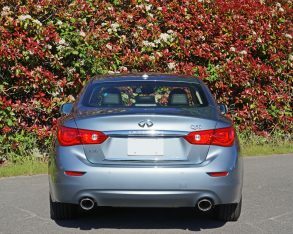 The car’s previous strength had become its weakness of late. 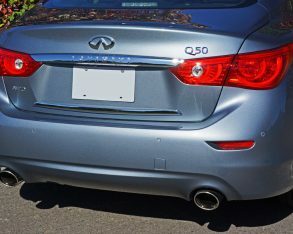 Last year all Q50s came with a standard V6 that walloped each and every rival when it came to base output, the 3.7-litre engine’s 328 horsepower and 269 lb-ft of torque delivering unparalleled bang for the buck yet still not satisfying two important types of customers. 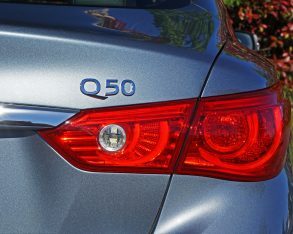 The first group are the world’s regulatory bodies that keep demanding ever more stringent fuel economy and emissions standards, and the second are buyers that want all the luxury and dynamic handling offered by the Q50, but not the fuel expense. 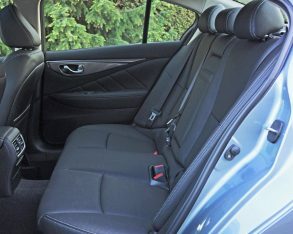 As it turns out there aren’t anywhere near as many buyers for the latter as bureaucrats enforcing the former, but the end result is nonetheless a very pleasing road car. 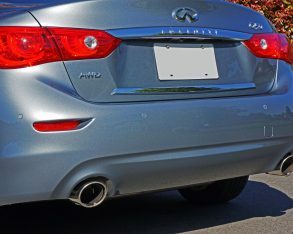 2.0-litre turbocharged four-cylinder, produced in Tennessee. 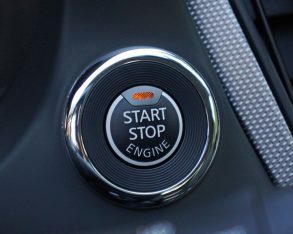 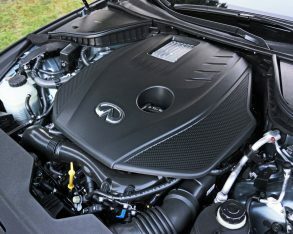 The proven engine is a bit low on power compared to most competitors albeit big on torque, exactly what’s needed to make a well-equipped luxury car move down the road quickly. 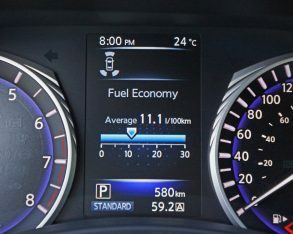 The numbers read 208 horsepower and 258 lb-ft, its peak torque arriving at a mere 1,500 rpm, while fuel economy goes from 12.5 L/100km city and 8.7 highway for last year’s 3.7 to a much more agreeable 10.6 city and 8.4 highway, assisted in part by an auto start/stop system that shuts the engine off when it would otherwise be idling. 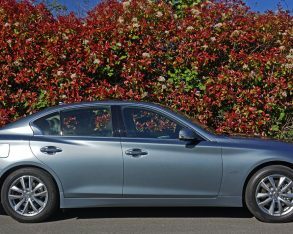 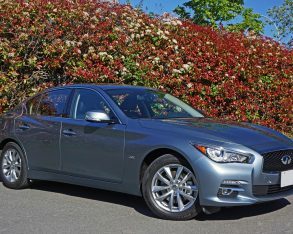 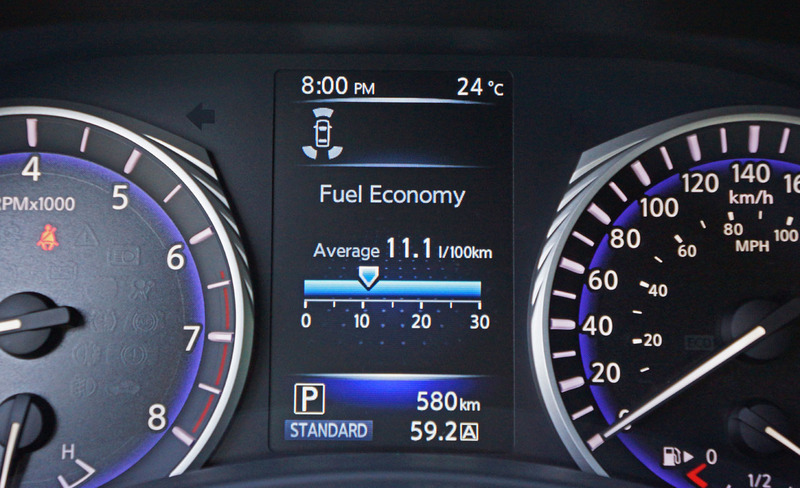 That’s not quite as good as the 8.7 city and 7.6 highway rating for the Q50 Hybrid, but it’s still very good. 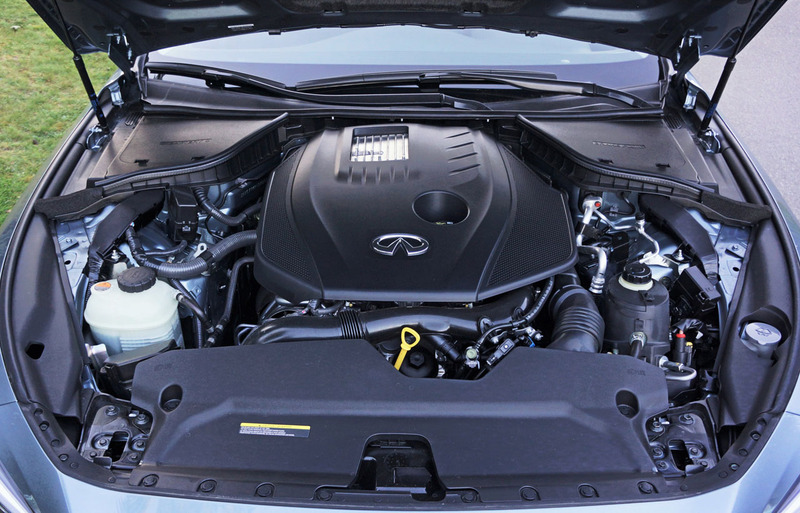 its engine lineup with two variants of an all-new twin-turbocharged V6. 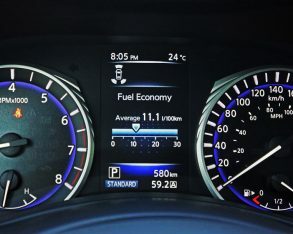 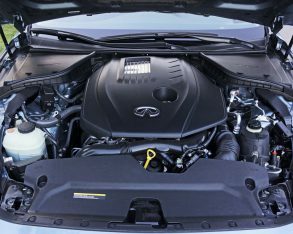 As planned, the more modest of its two 3.0-litre units would become the Q50’s bread and butter powertrain thanks to an energetic 300 horsepower and 295 lb-ft of torque and a still more fuel-efficient rating of 12.3 L/100km city and 8.5 highway, while a new top-line variant has pushed the brand up into AMG and M territory thanks to 400 horsepower and 350 lb-ft of torque, while nevertheless proving economical with a rating of 12.3 city and 9.1 highway. 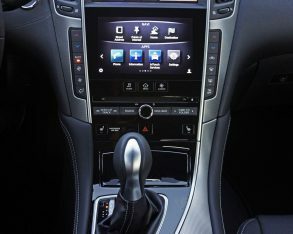 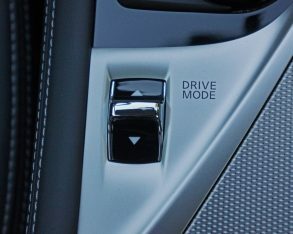 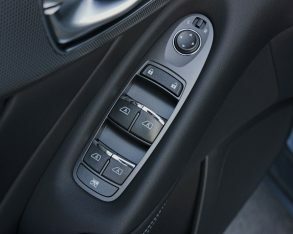 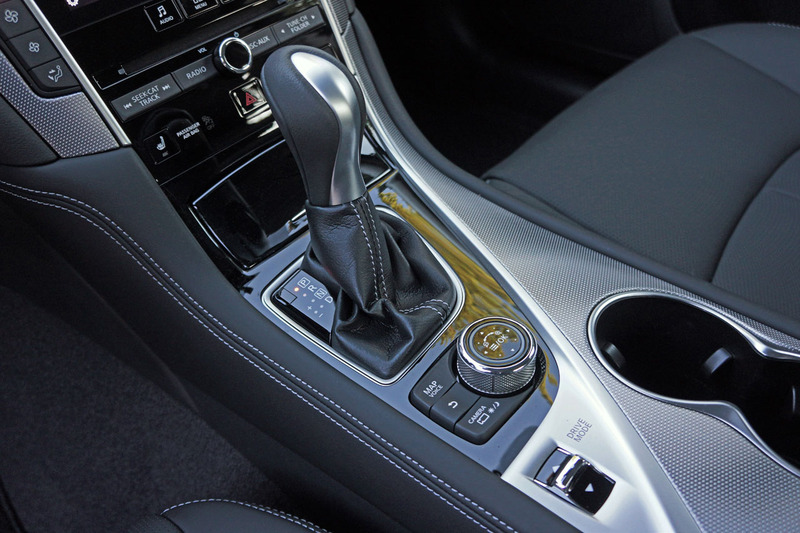 from Daimler, but instead is the same wonderfully advanced seven-speed autobox sourced from Nissan’s Jatco division that most other Infiniti models enjoy. 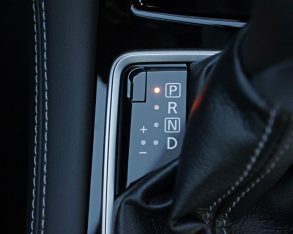 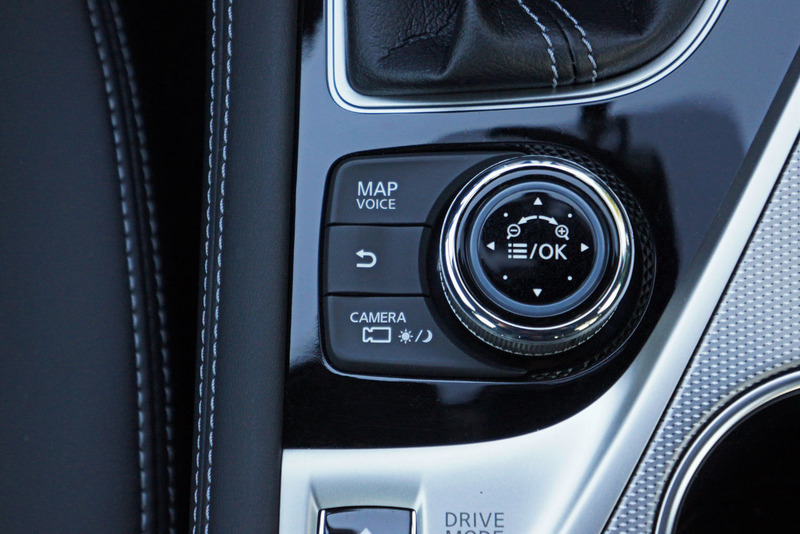 Long one of the best automatics in the business, it features downshift rev-matching and adaptive shift control (that can even be navigationally synchronized when equipped) resulting in a much better pairing than this engine gets from Mercedes. 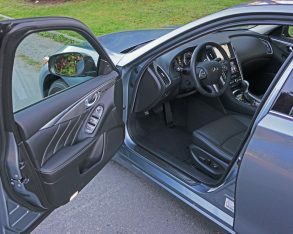 That said the German brand’s competitive C 300 4Matic doesn’t use the same tuning, but instead benefits from a 241 horsepower alternative. 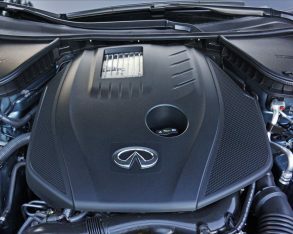 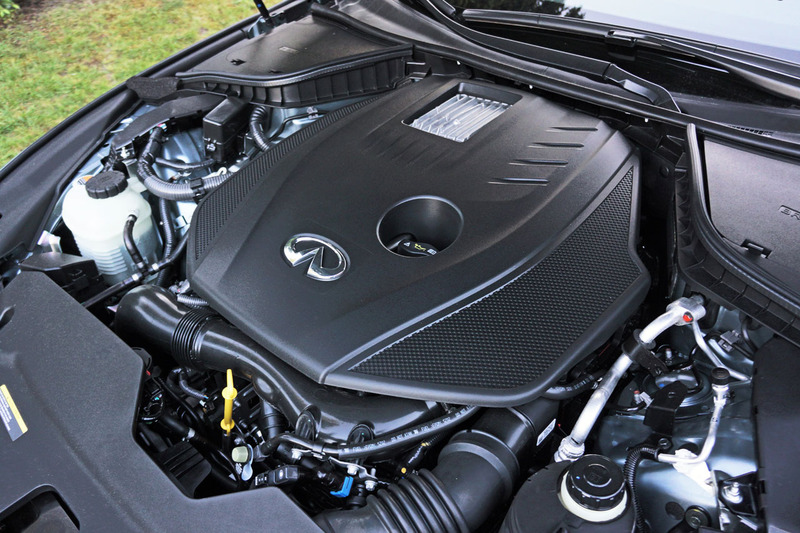 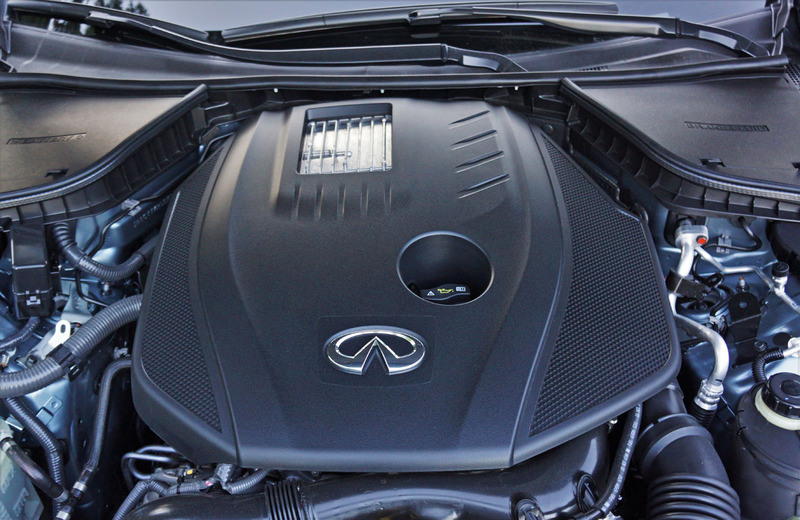 Instead, the Q50’s base engine comes standard in the Mercedes CLA 250, GLA 250, and the new Infiniti QX30 that shares much with the latter subcompact Merc SUV. 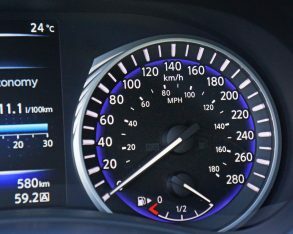 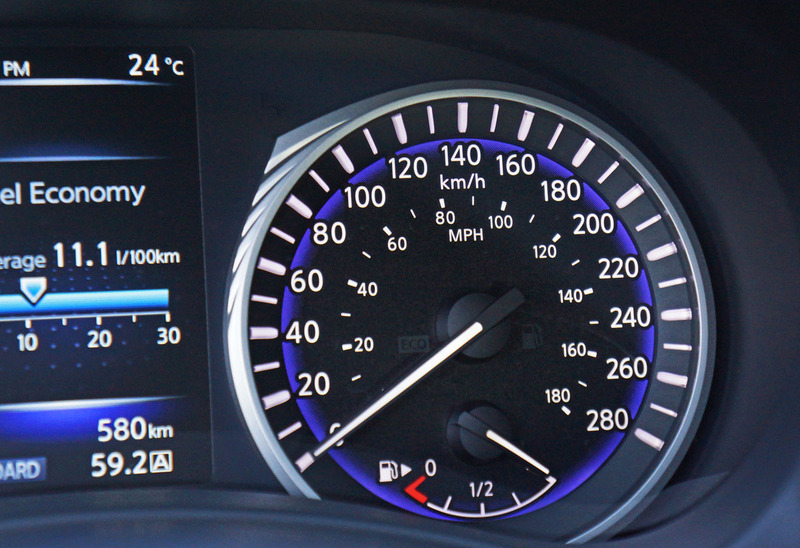 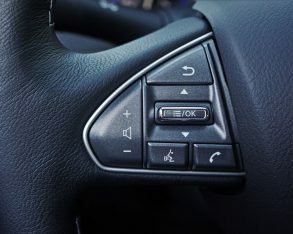 suggest, response from standstill immediate and acceleration reasonably brisk when pushed; zero to 100km/h taking 7.4 seconds. 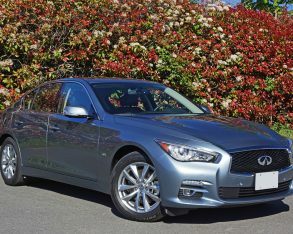 It even sounds nice, unlike some others in this class that cause me to pull up next to the yellow diesel pump despite their 91-unleaded requirement, while less weight over the front wheels results in a lighter, nimbler chassis that’s plenty of fun through the corners yet just as stable as V6-powered Q50s at high speed. 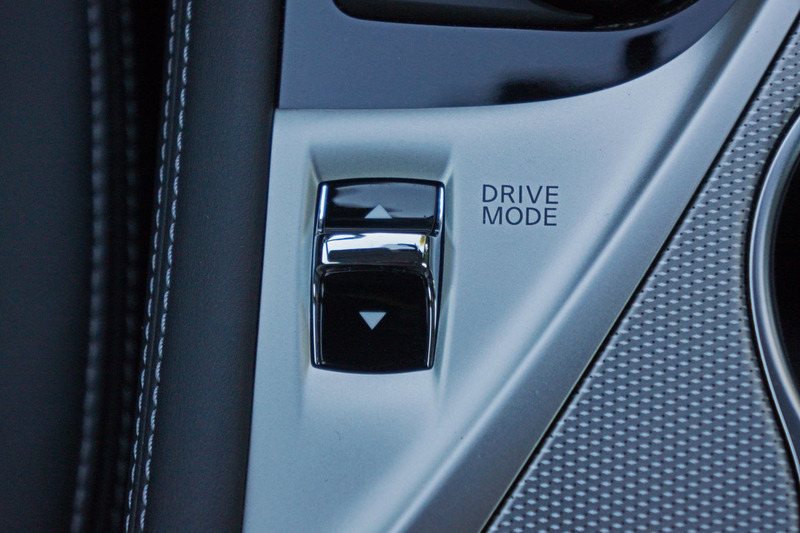 handing it any awards for engaging the driver. 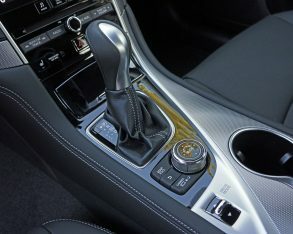 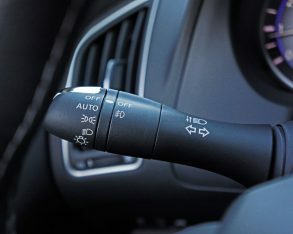 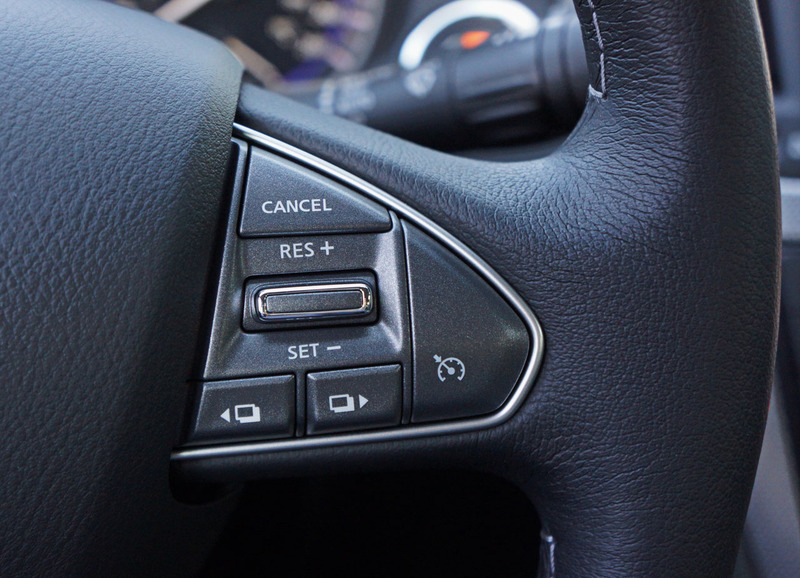 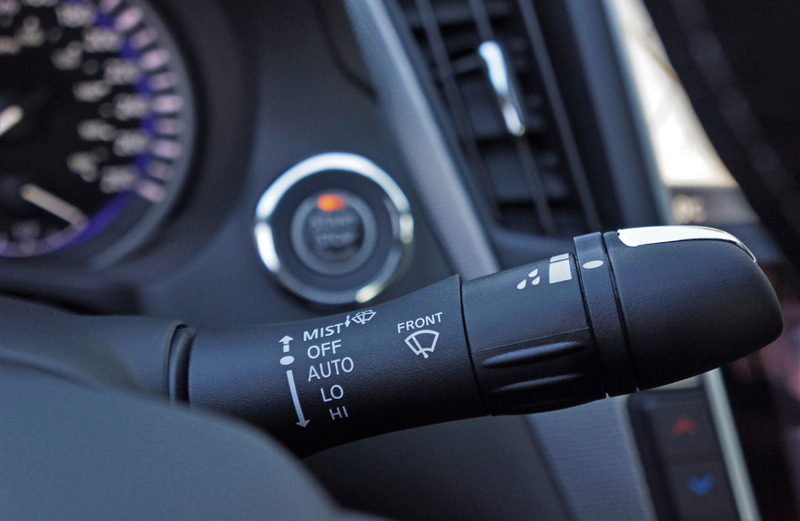 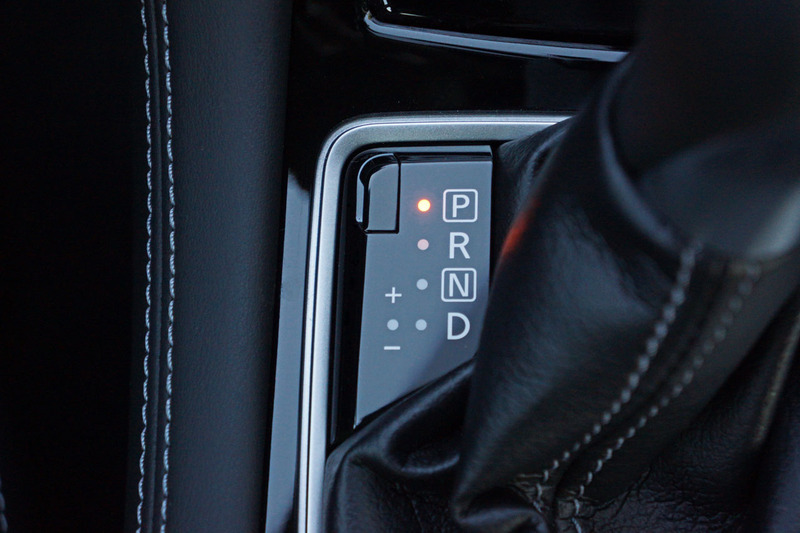 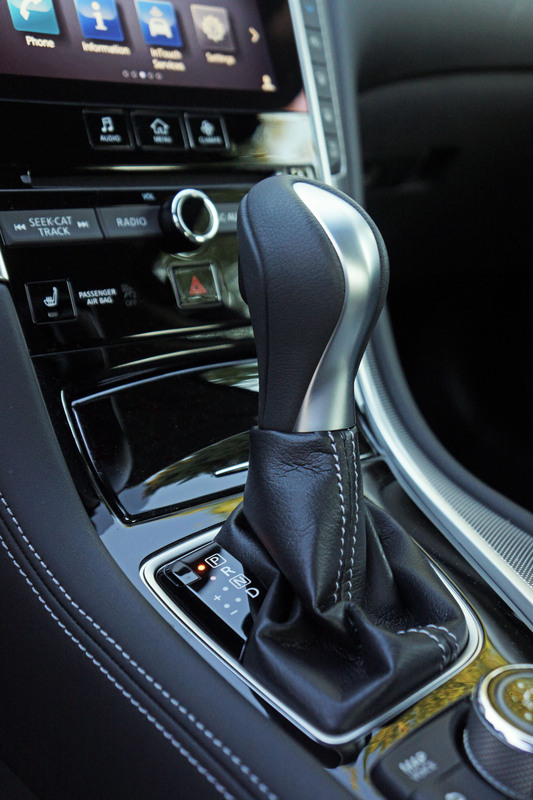 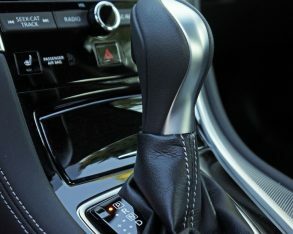 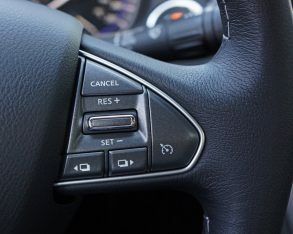 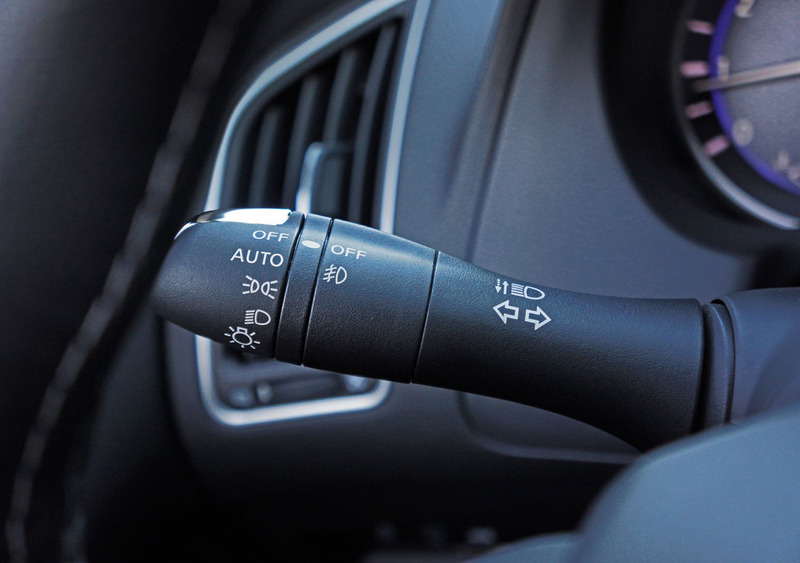 Still its gear lever allows plenty of right hand action when required, but I can’t help but wonder if the majority buying into this base model will bother. 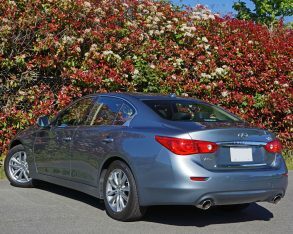 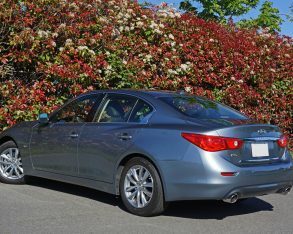 This is entry-level luxury with sporting tendencies, whereas true performance aficionados will certainly ante up for the previously noted 3.0t, 3.0t Sport or Red Sport 400.
augmented with coil springs over dual flow path dampers and a stabilizer bar forward and rearward, provide all the mechanical grip needed. 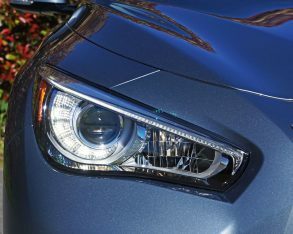 Lastly, the entry Q50 gets sizeable 12.6-inch front and 12.1-inch rear ventilated disc brakes for impressive stopping power and very little fade after repeated applications. 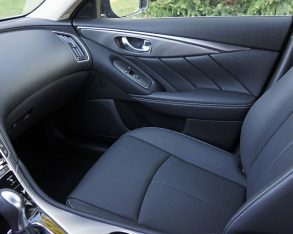 Again, performance is strong across the board, but to be clear this lesser model is optimized for comfort and quietness. 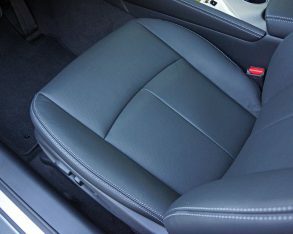 stitched armrests, and fairly natural feeling pleather seat upholstery. 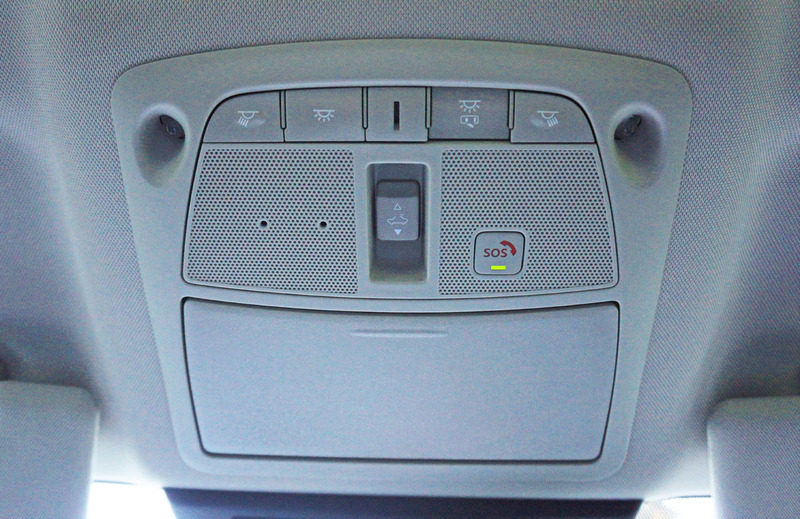 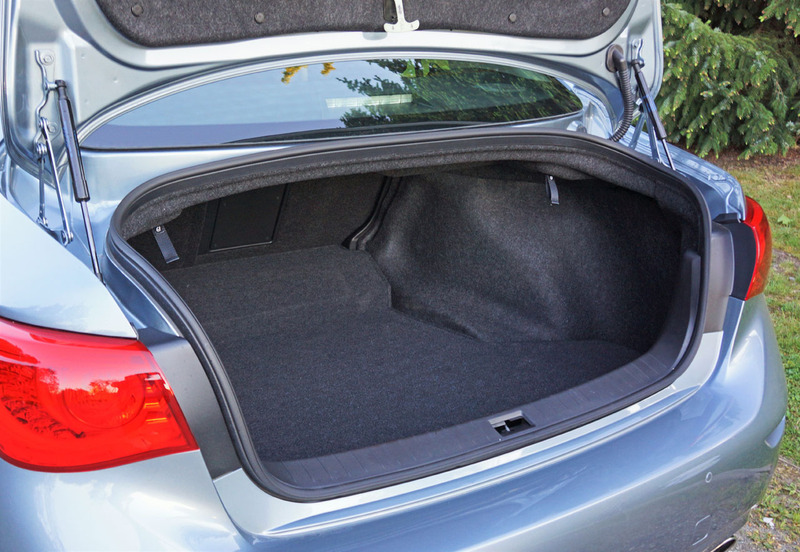 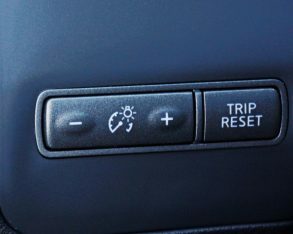 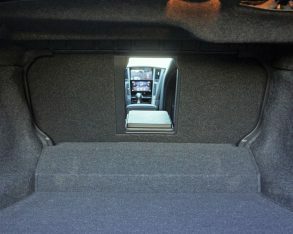 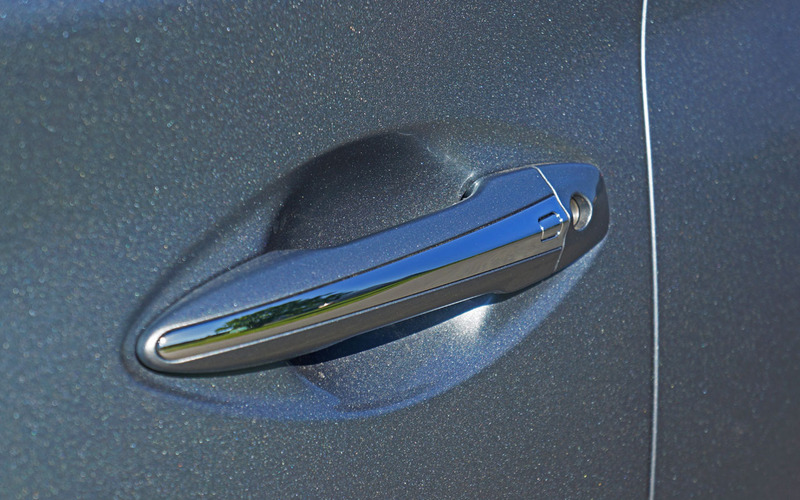 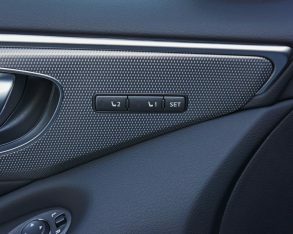 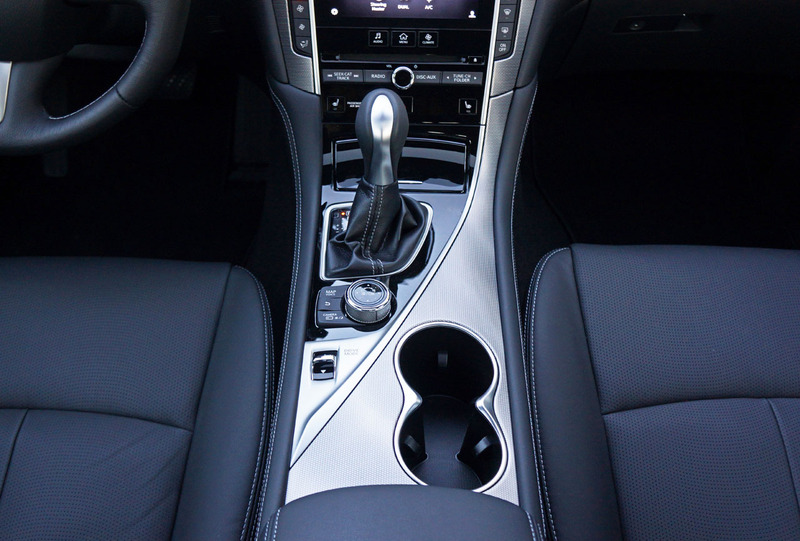 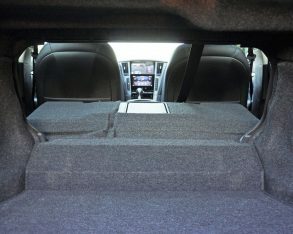 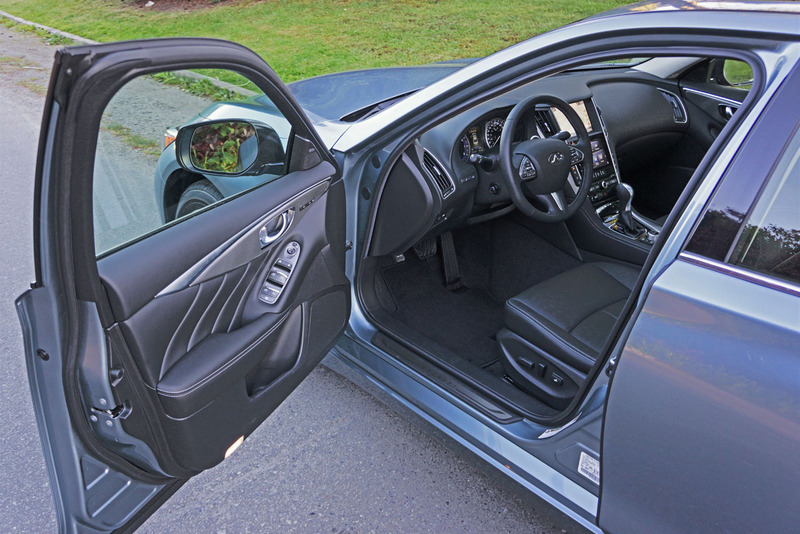 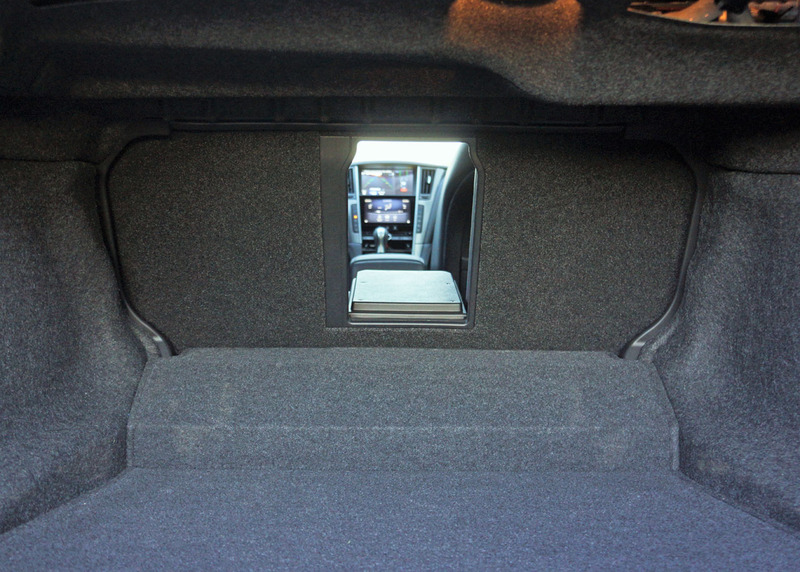 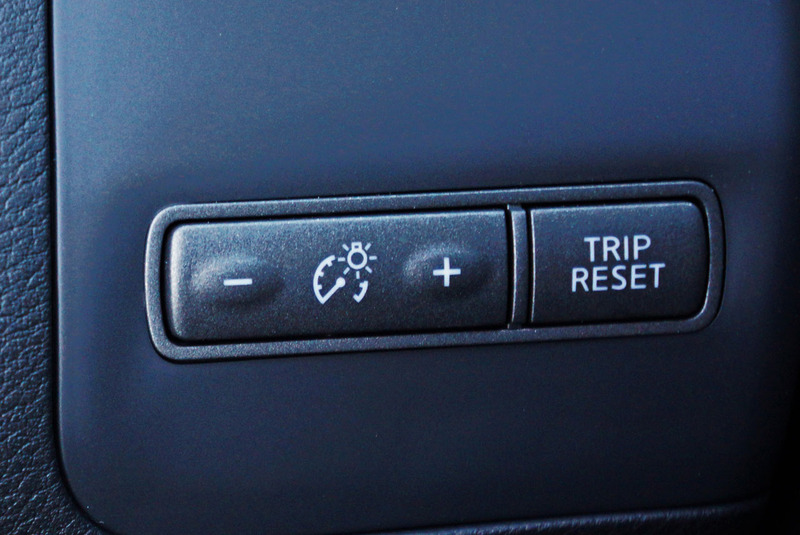 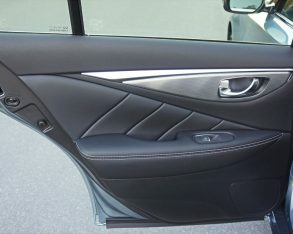 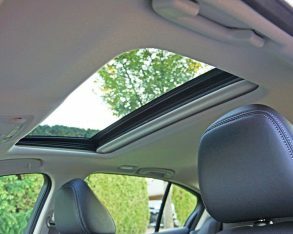 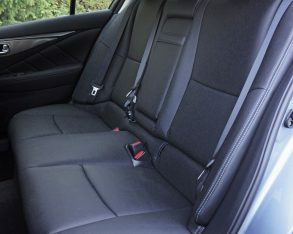 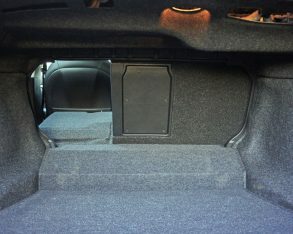 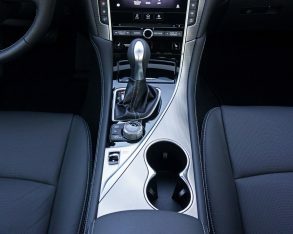 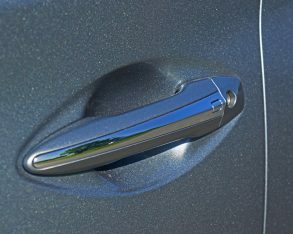 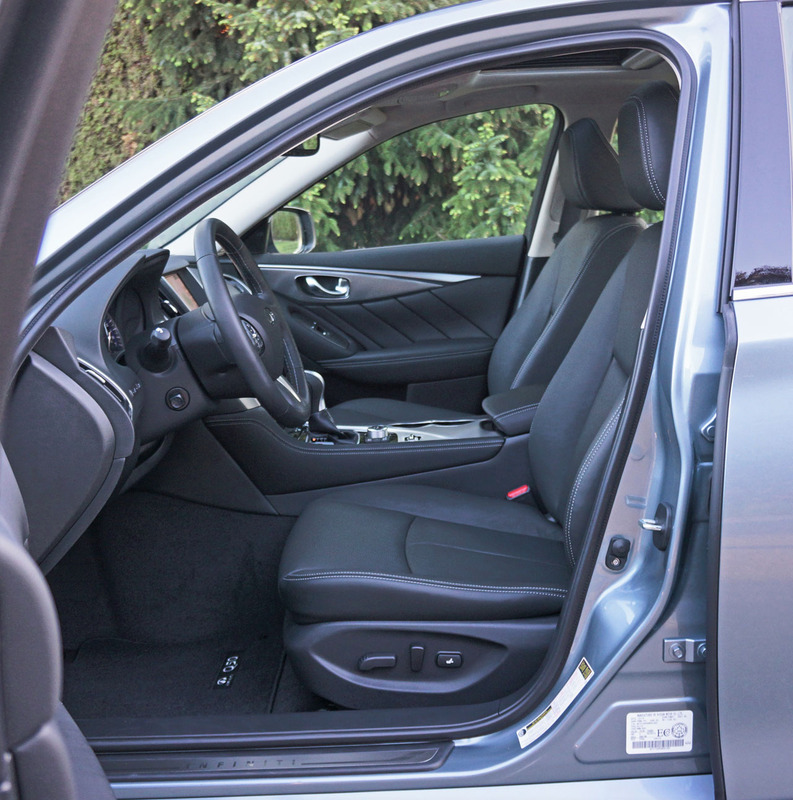 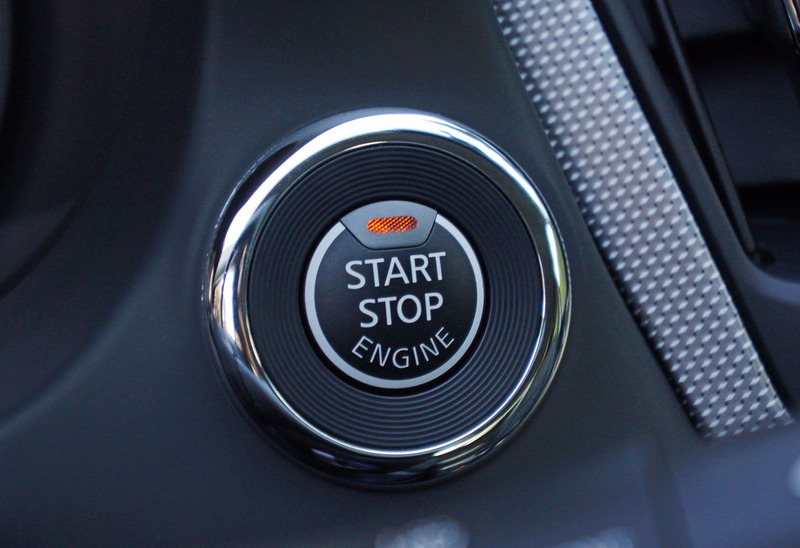 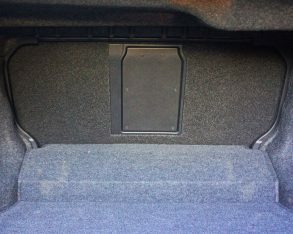 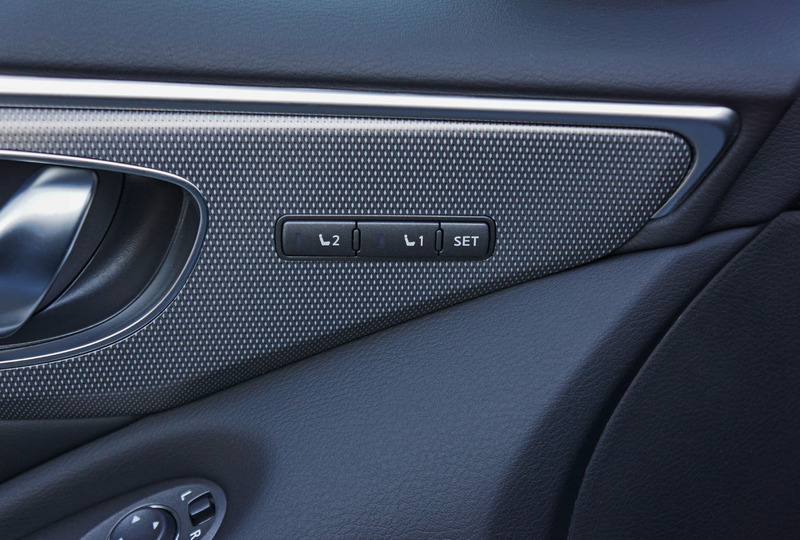 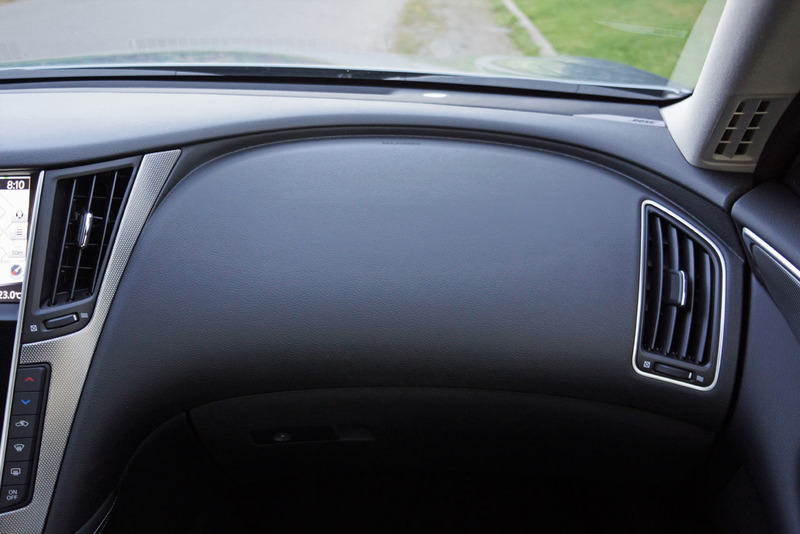 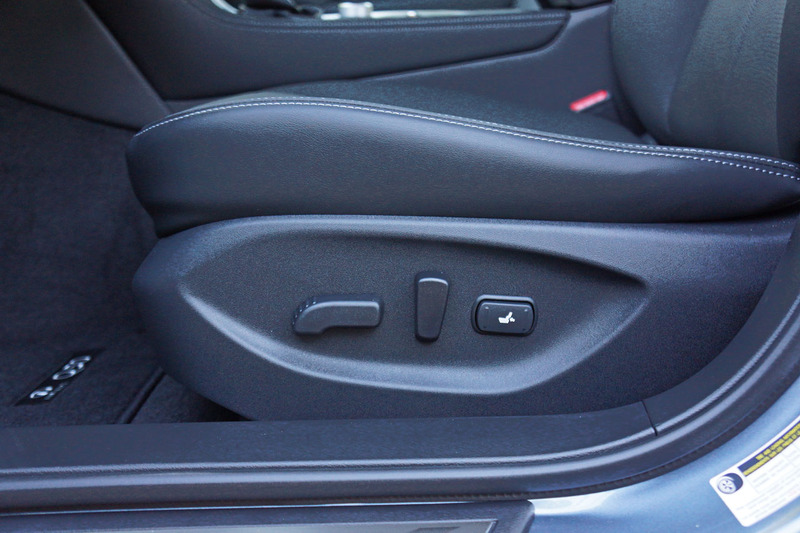 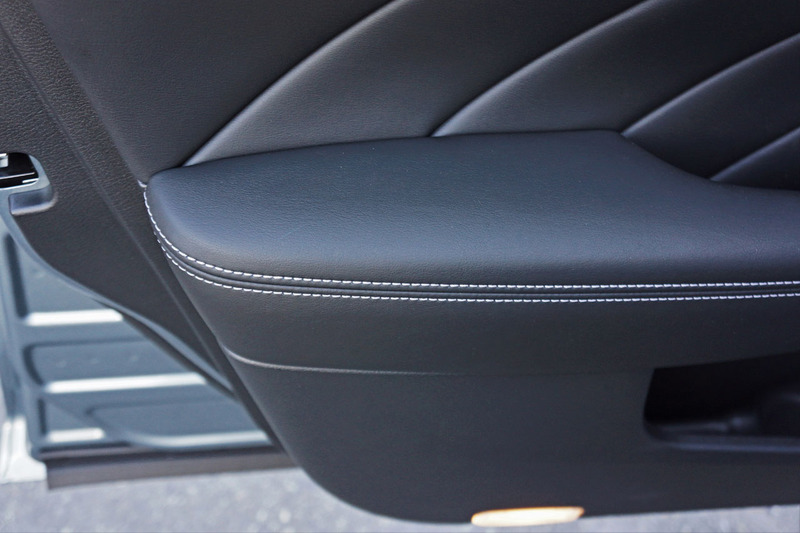 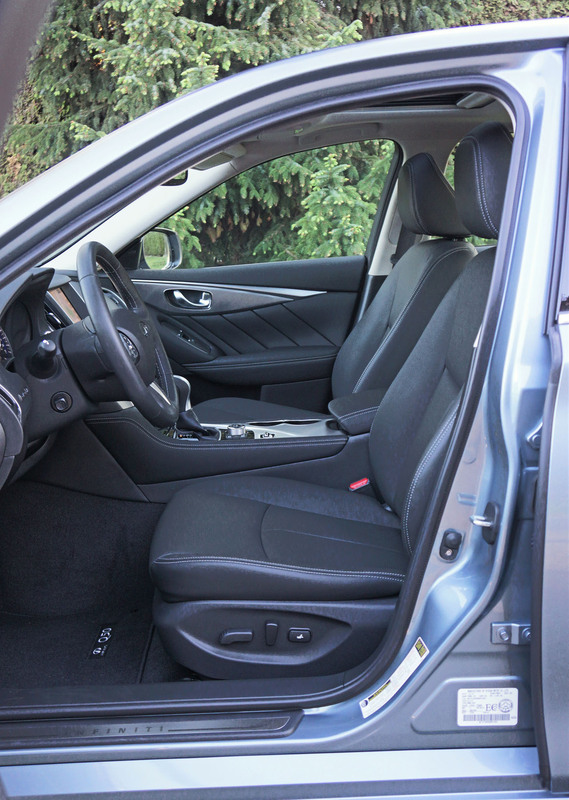 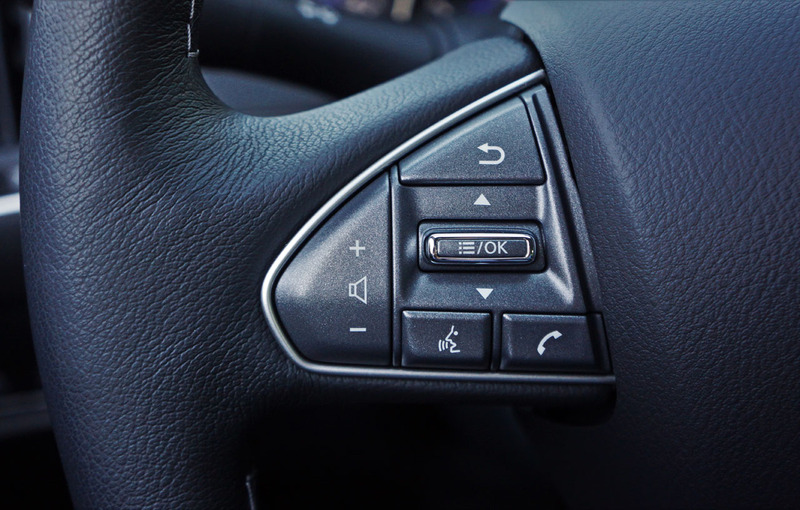 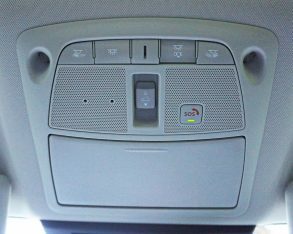 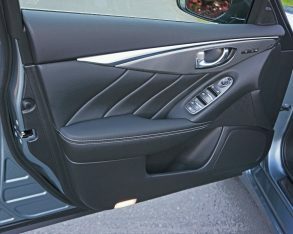 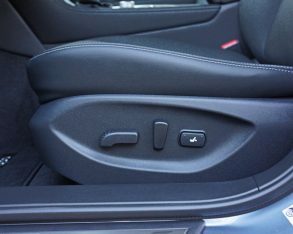 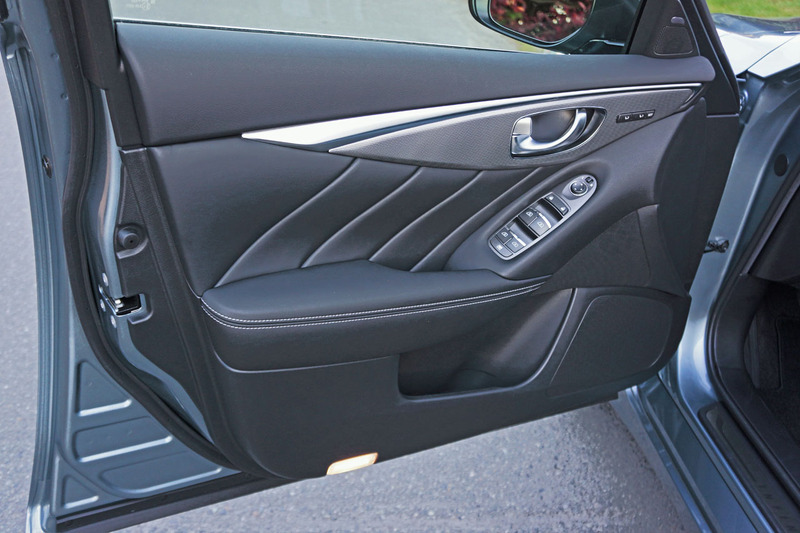 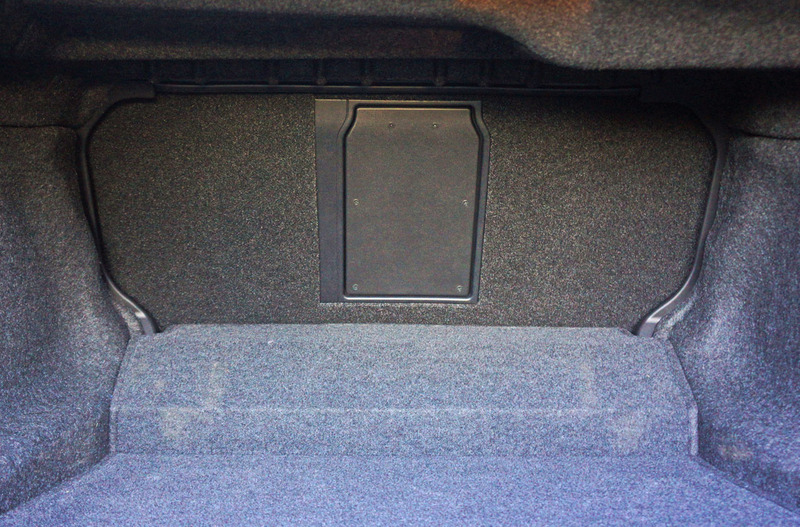 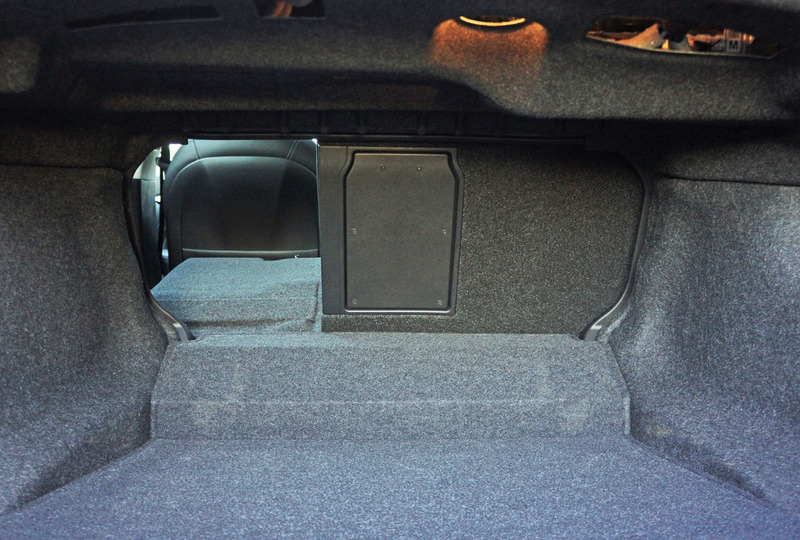 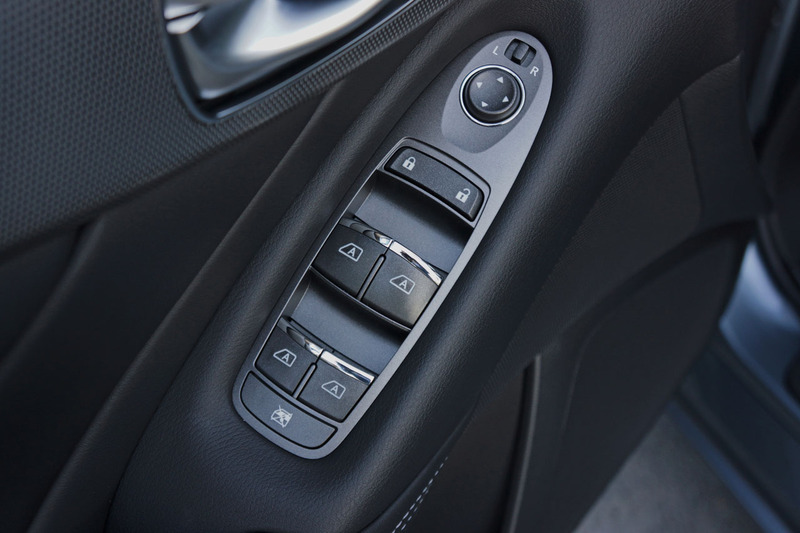 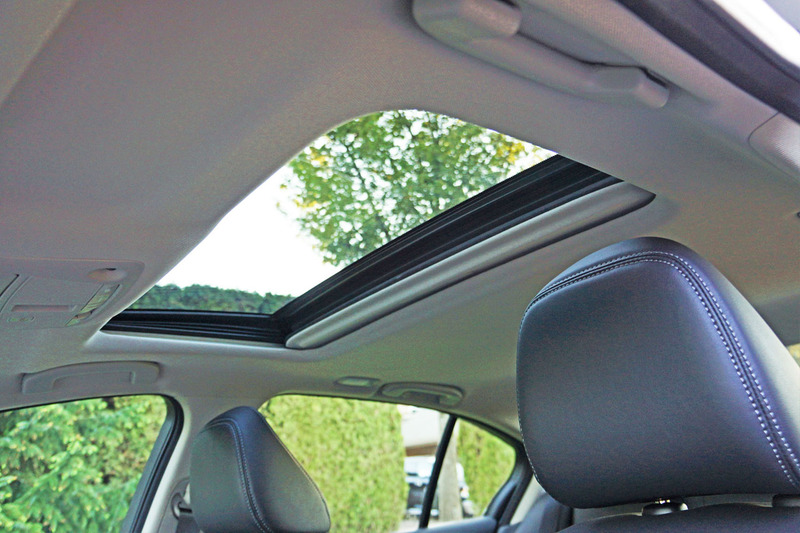 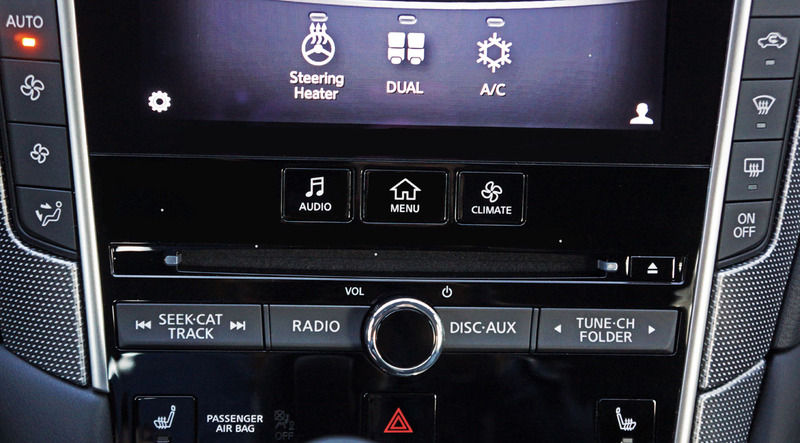 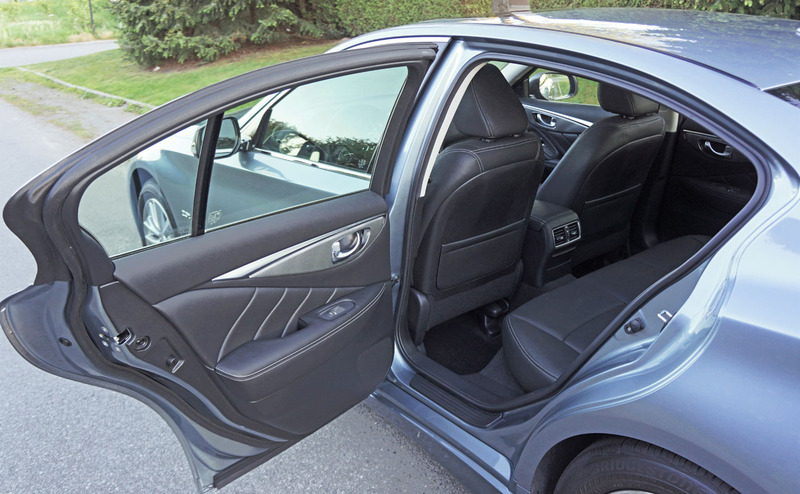 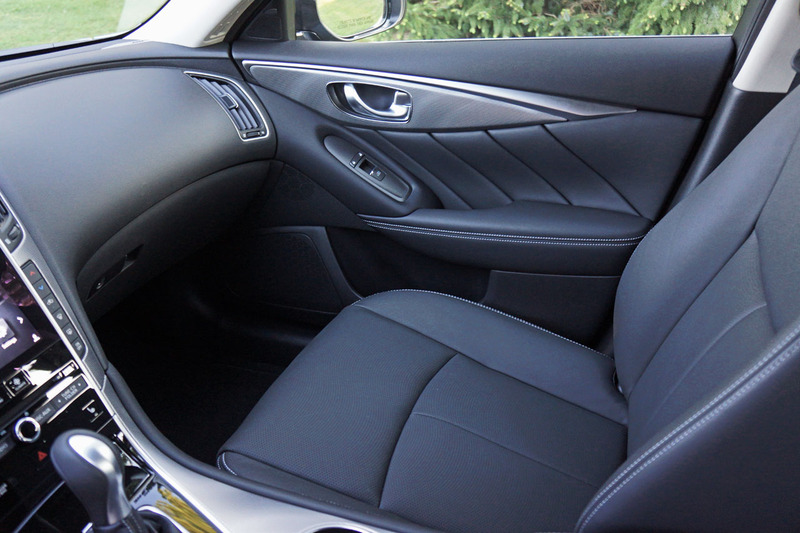 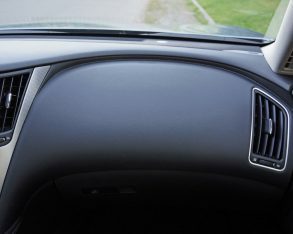 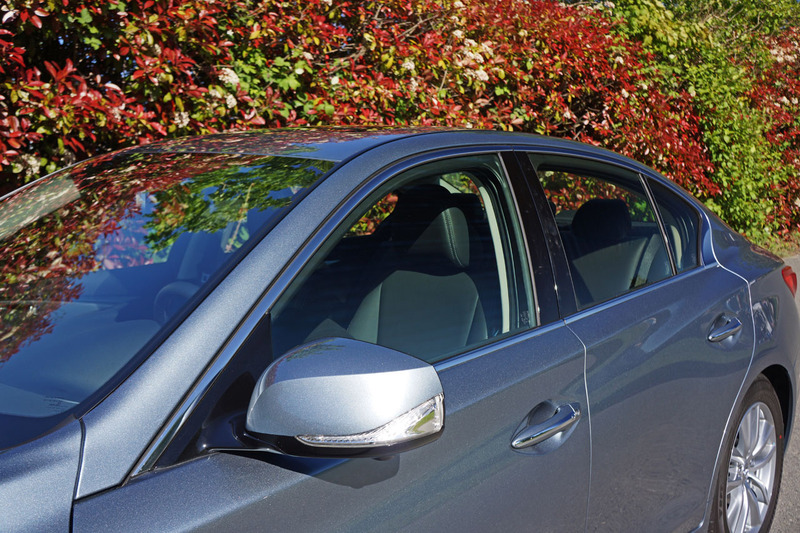 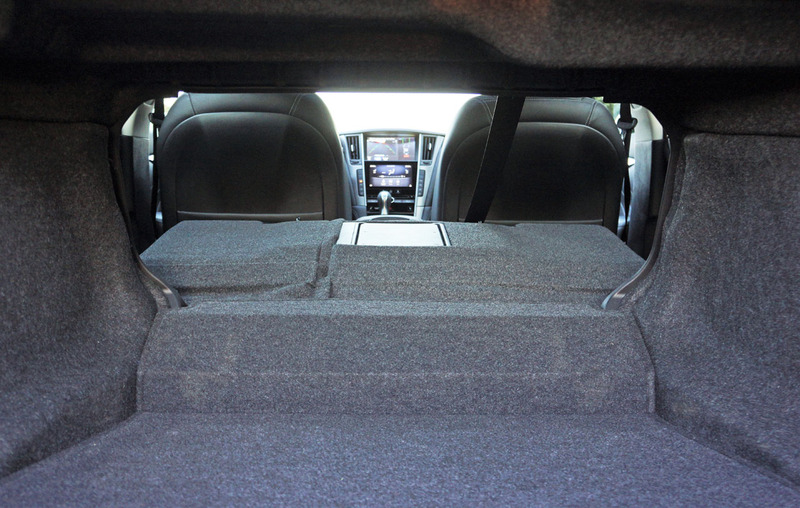 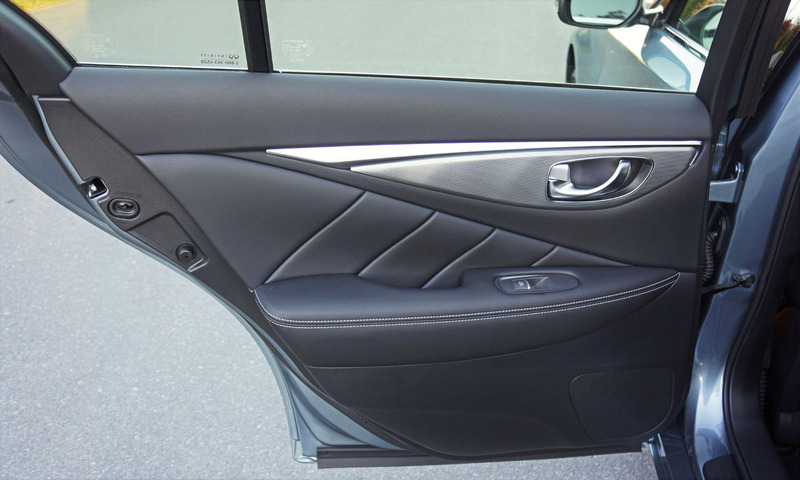 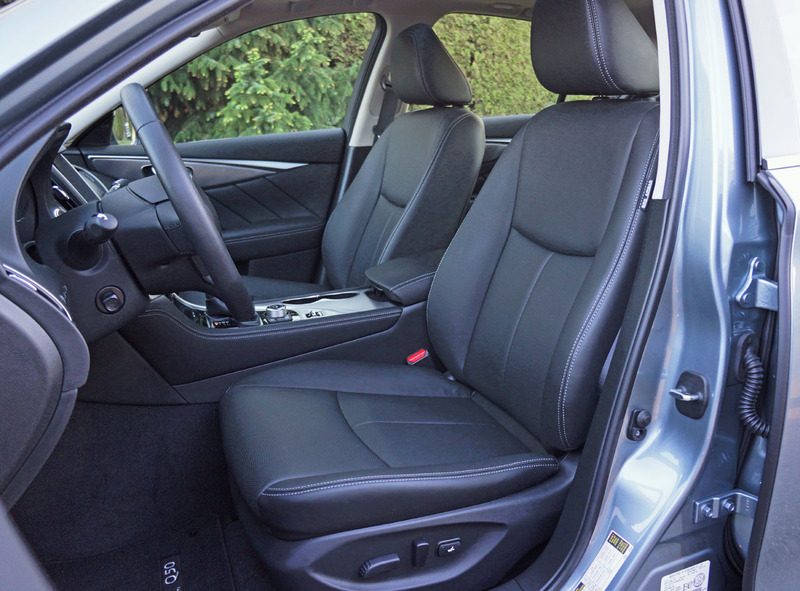 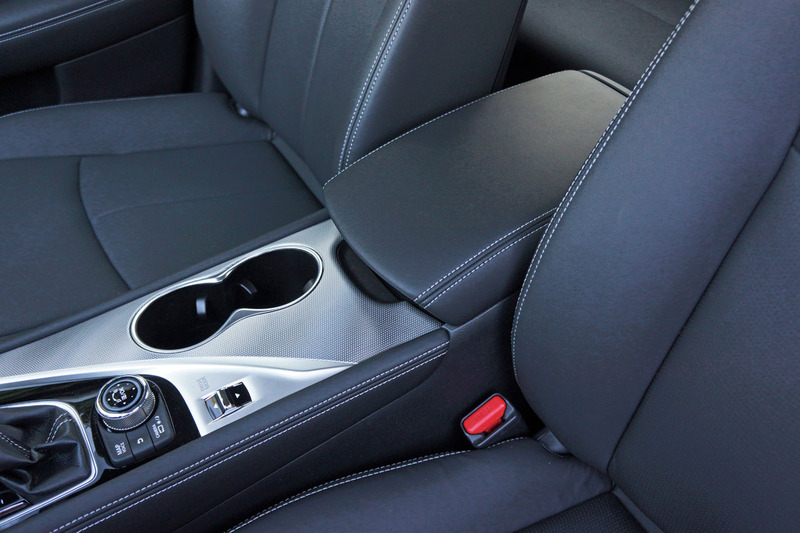 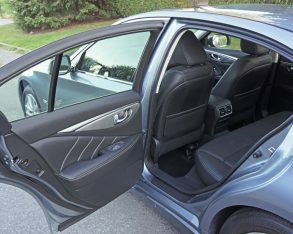 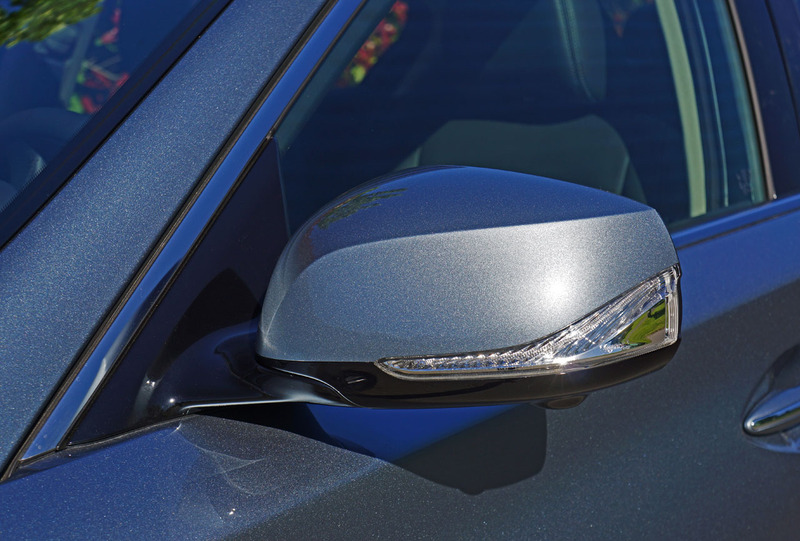 Even the glove box lid is soft synthetic, but the lower door panels and lower IP, next to your knees, are made from less appealing harder plastics. 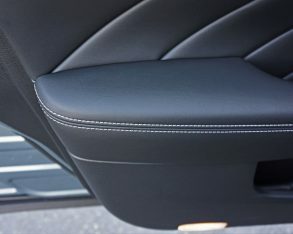 Still, the sides of the lower console are finished better than most any competitor, with padded leatherette that’s contrast stitched to match the seats, armrests and leather-wrapped steering wheel. 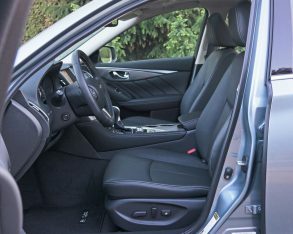 $39,900 makes it one of the pricier vehicles in its class, only exceeded by the more basic $39,990 BMW 320i xDrive and expectedly higher priced Mercedes-Benz C 300 4Matic, plus Jaguar has just arrived with its 2017 XE that’s priced at a no excuses $48,500-at least the Brit’s got balls, especially considering its cabin uses more low-end hard plastics than the Q50 and most others in the segment. 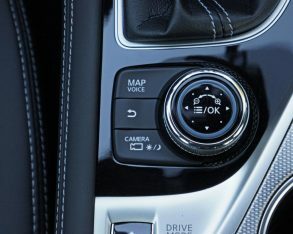 pushbutton ignition, aluminum front doorsill kick plates, speed-sensing variable intermittent wipers, a leather-wrapped shift knob with aluminum accents to go along with that steering wheel, genuine Kacchu aluminum trim, Fine Vision electroluminescent primary gauges featuring a large colour multi-information display at centre, eight-way powered front seats, a heatable steering wheel and front seats, dual-zone auto HVAC, InTouch dual infotainment displays (including eight-inch upper and seven-inch lower colour LCD/VGA screens), a rearview camera, voice recognition for audio, SMS text and vehicle information, a powered sunroof, Bluetooth phone and audio streaming, six-speaker audio with satellite and high definition AM/FM radio, a CD, RDS and speed-sensitive volume, two USB ports, front and rear reading lights, self-fixable Scratch Shield paint, tire pressure monitoring, hill start assist, and all the expected active and passive safety features. 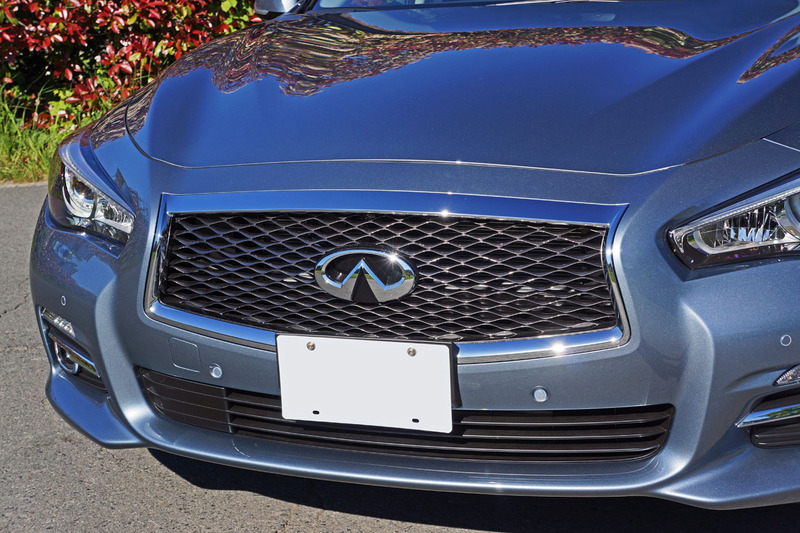 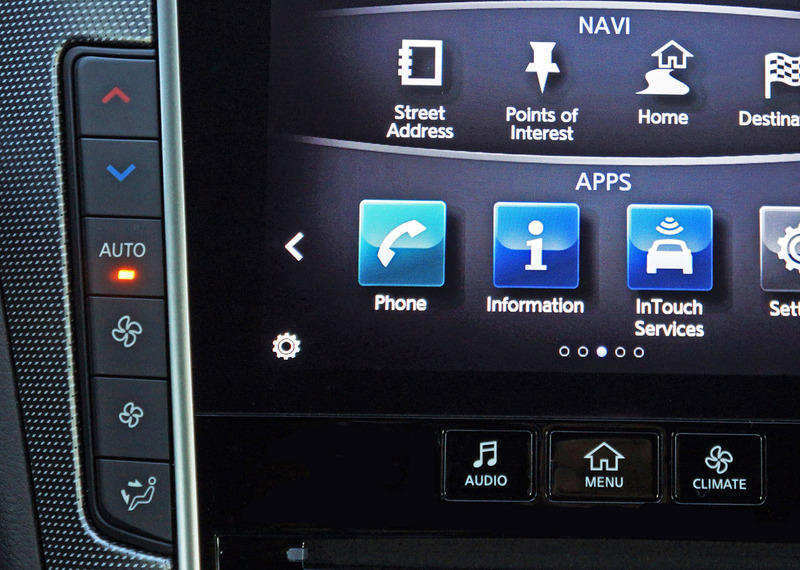 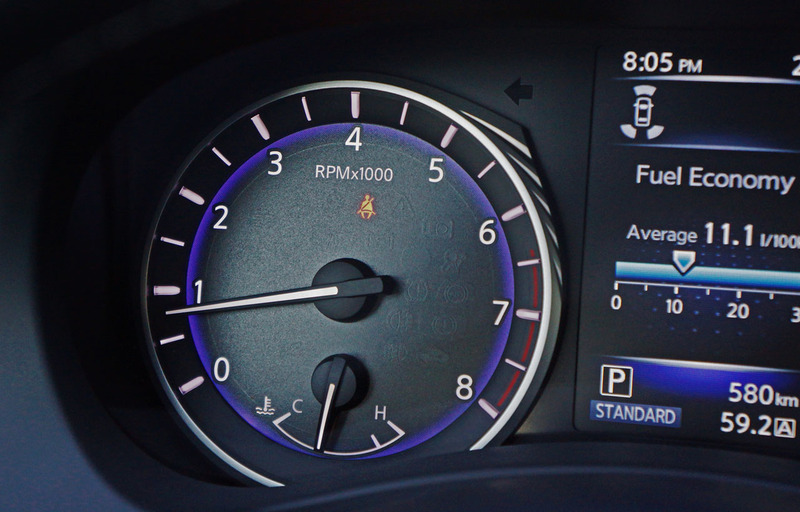 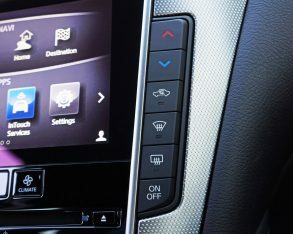 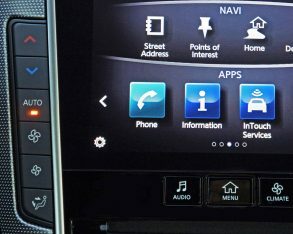 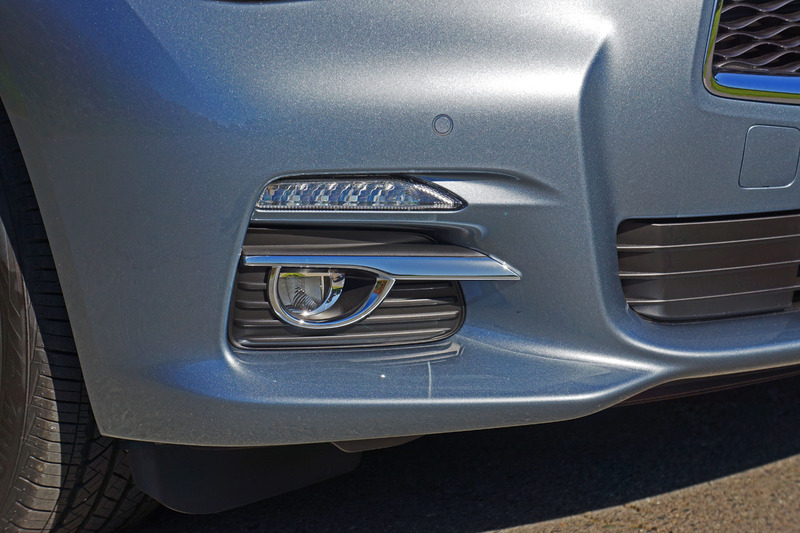 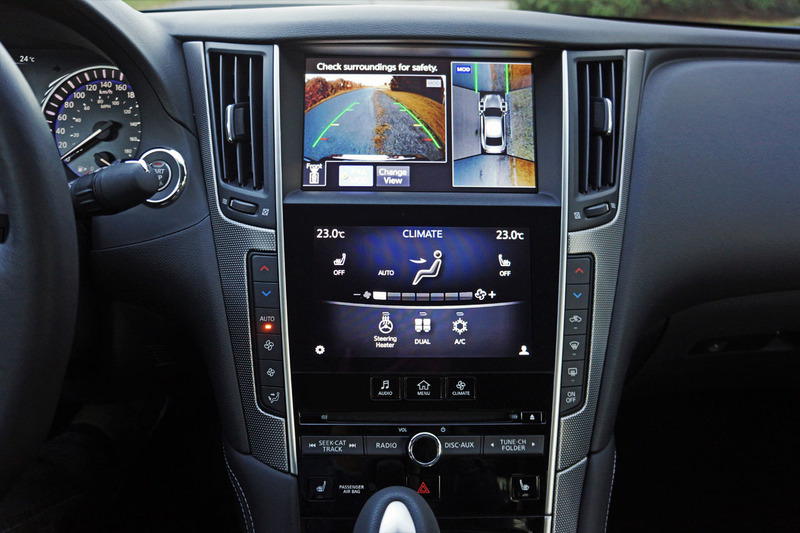 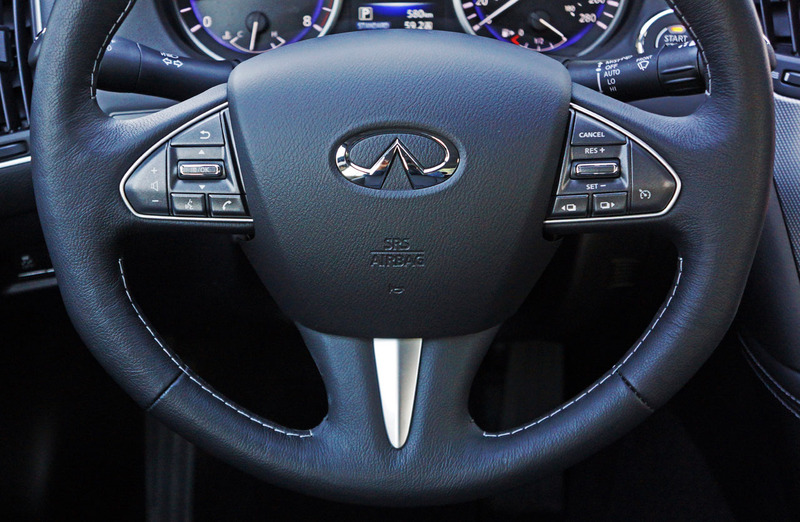 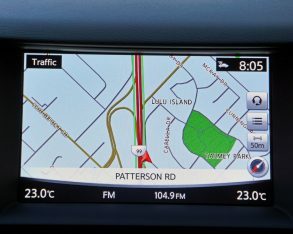 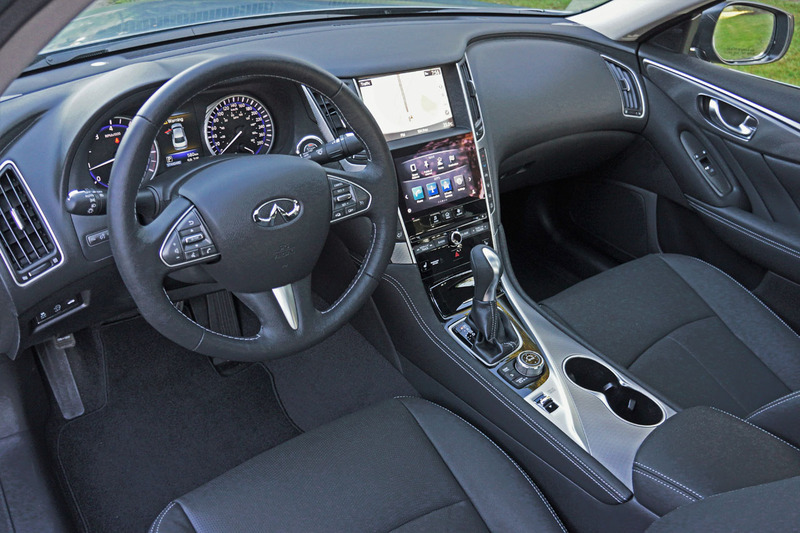 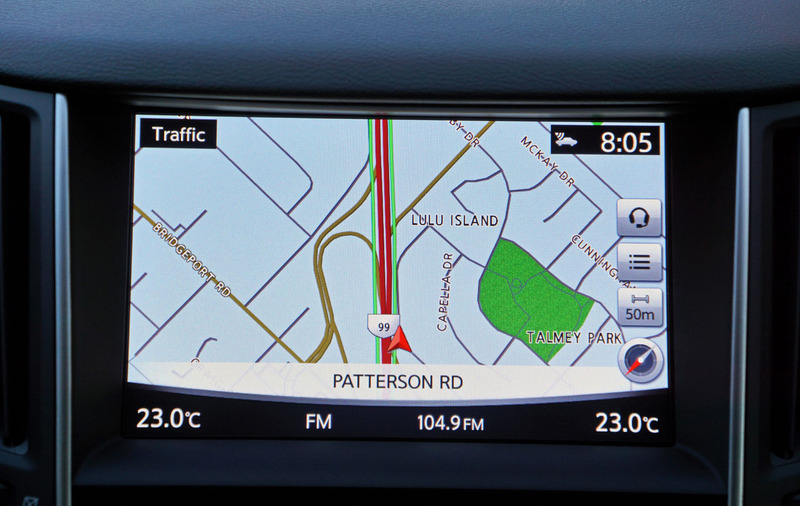 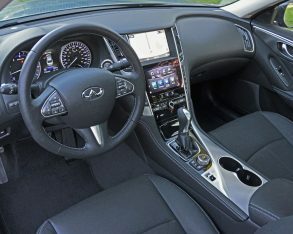 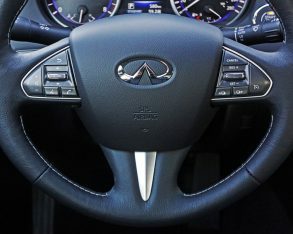 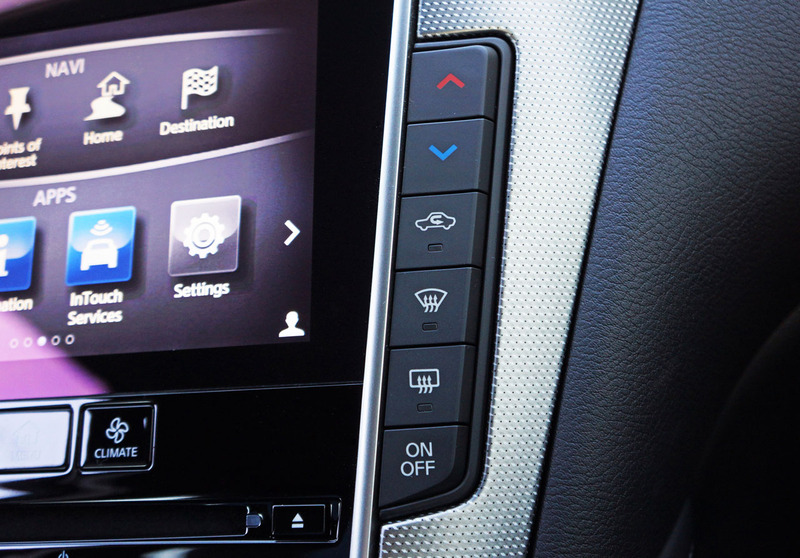 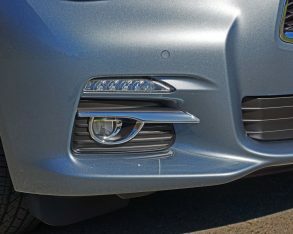 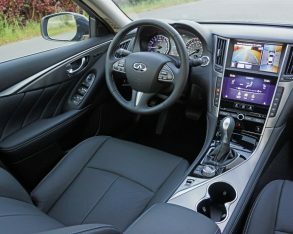 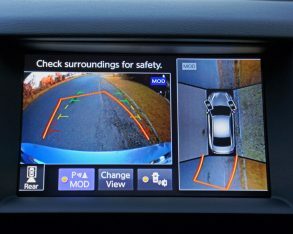 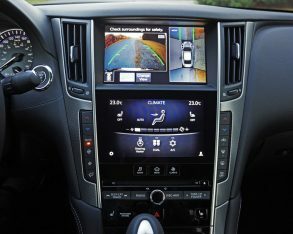 made quick work of finding regularly adjusted features, while the optional surround camera was superb, even showing the direction of the front tires to help with parking, and as always Infiniti’s available navigation is spot-on accurate, plus it includes clear and precise mapping. 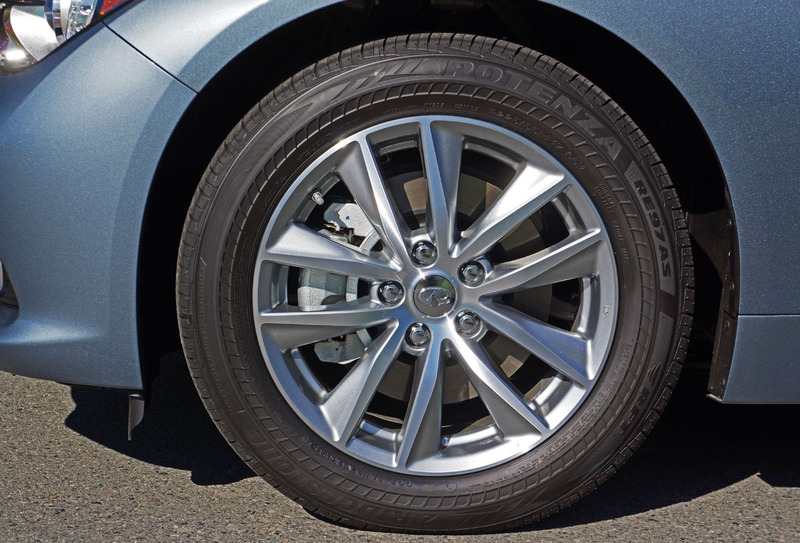 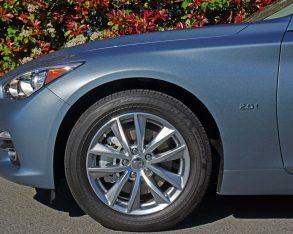 After running down each and every standard feature the Q50’s only obvious shortcoming is the size of its 17-inch alloys, which look out of place on a car that’s slightly larger than its key rivals. 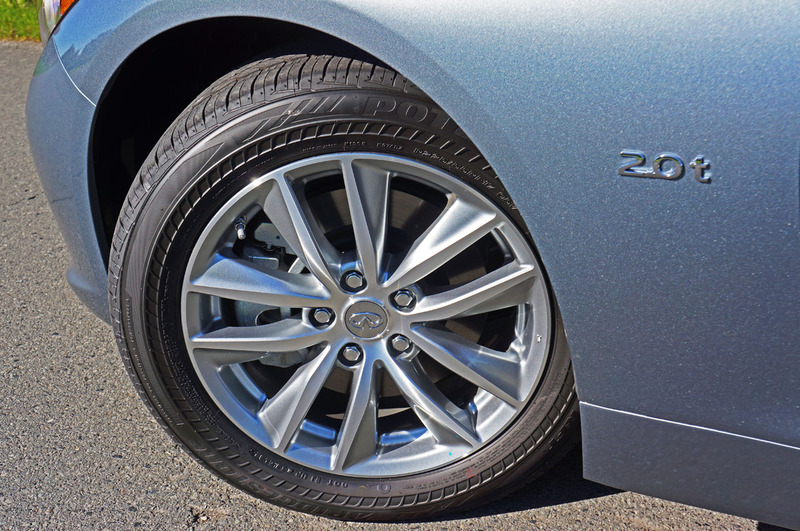 As noted the 225/55R17 all-season runflats perform well enough, and certainly do their part to improve ride quality and reduce interior NVH levels, but alas luxury is so much about image isn’t it? 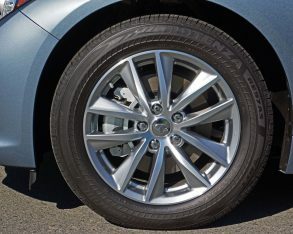 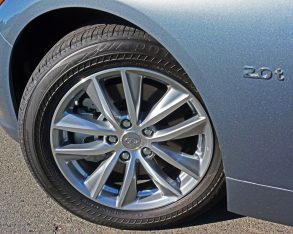 Then again you may appreciate the practicality of smaller rims when it comes time to replace these, as a set of four will be much less expensive to procure than 19s or 20s, but the segment’s usual standard 18s aren’t much pricier and look decidedly better. 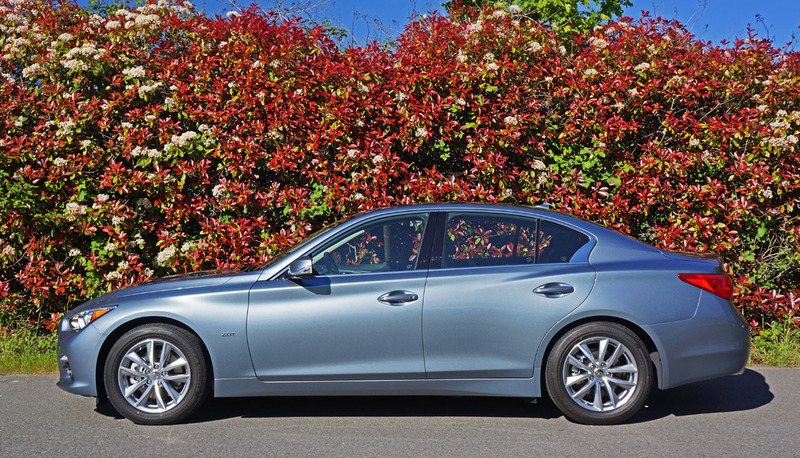 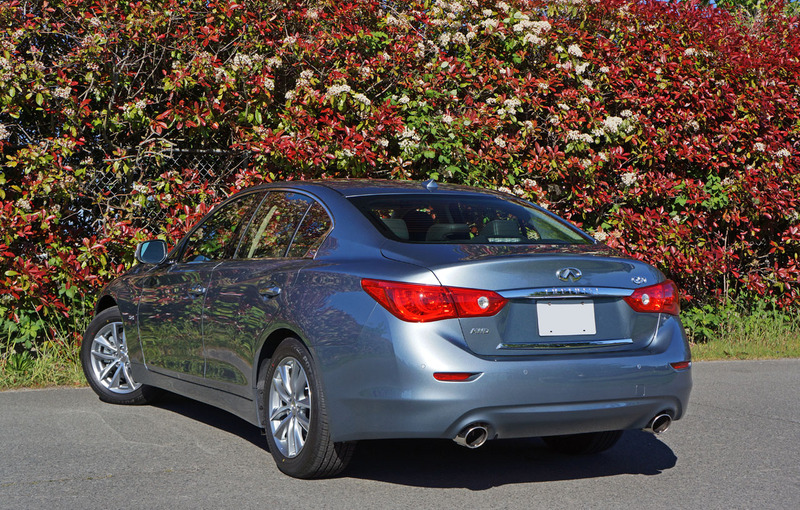 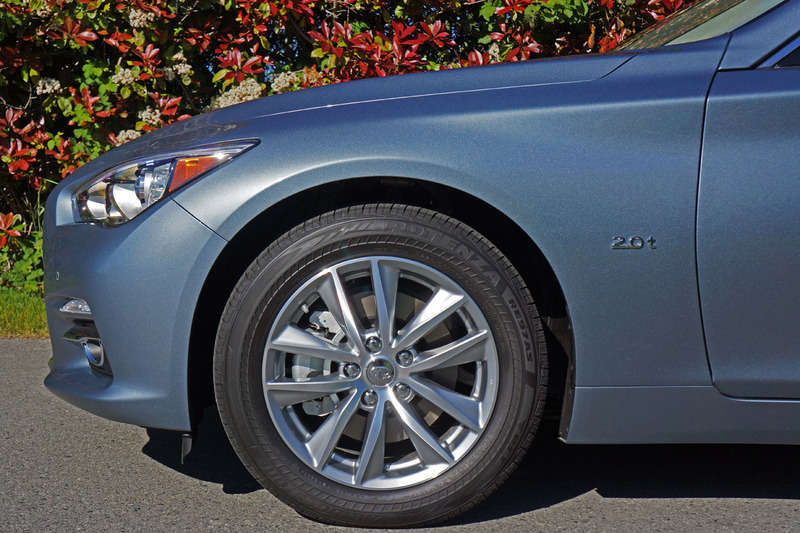 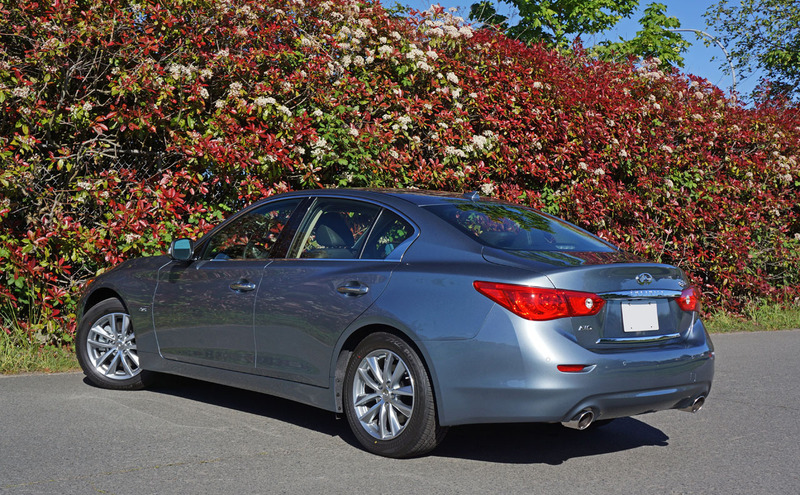 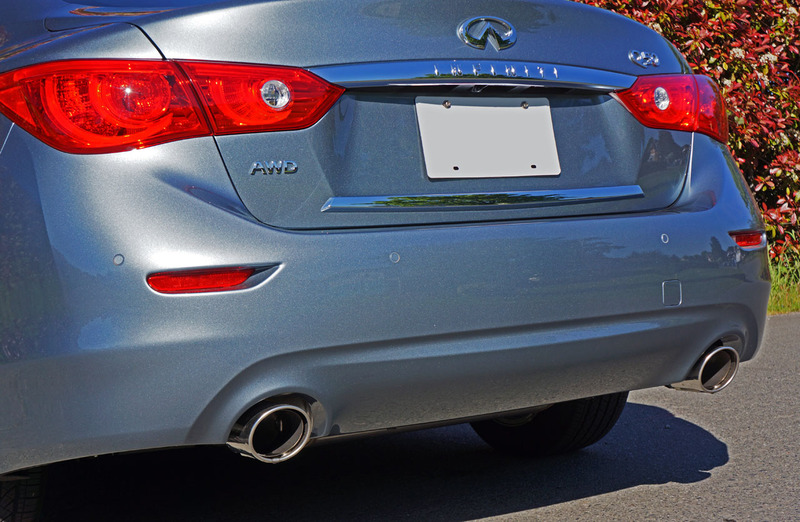 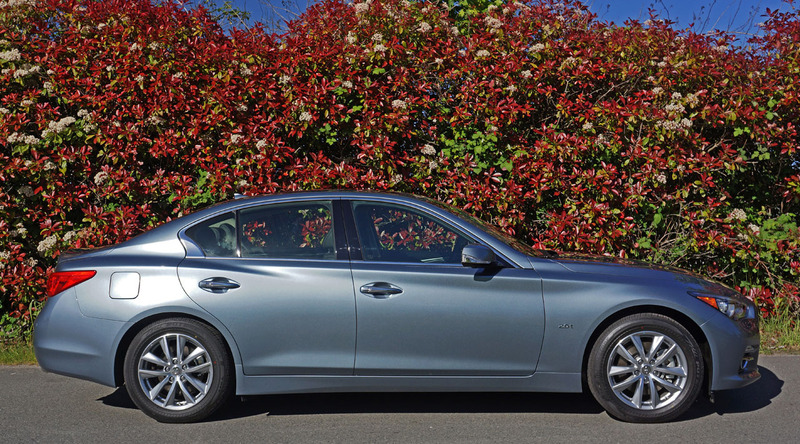 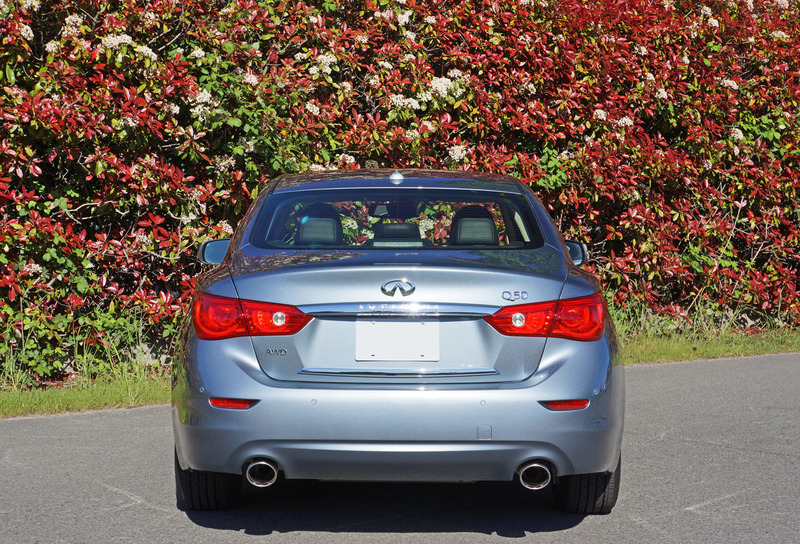 Oddly, Infiniti offers no wheel and tire upgrade for this base Q50. 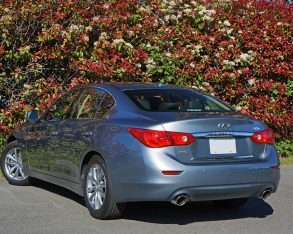 in mind, my test car’s gorgeous Hagane Blue paint added a very reasonable $285 charge, while a $4,000 Premium package increased content with an auto-dimming rearview mirror that’s normally standard in this class, upgraded voice recognition, great sounding Bose Centerpoint simulated surround audio, navigation with lane guidance and 3D mapping, the navigation synchronized adaptive shift control mentioned earlier, Infiniti Connection telematics with a one-year subscription, a Homelink universal garage door remote, and driver’s seat memory. 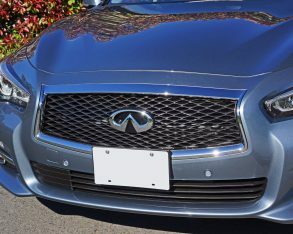 was deemed “Superior”). 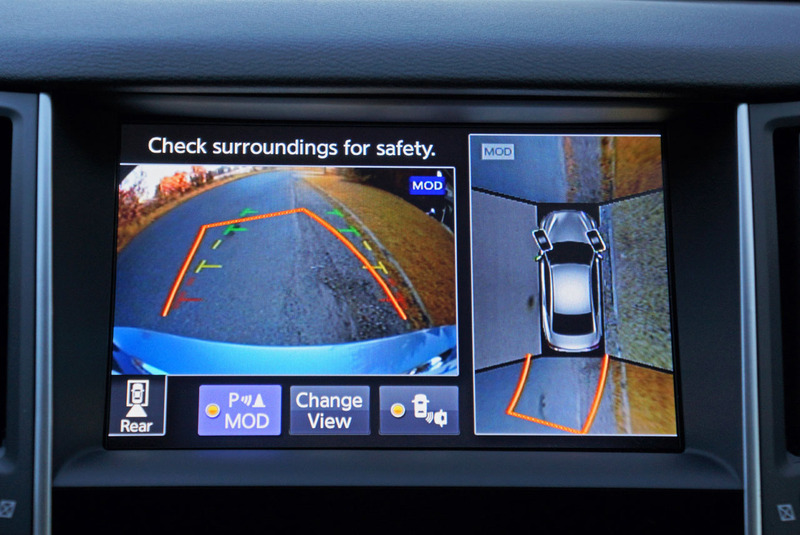 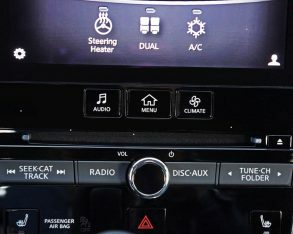 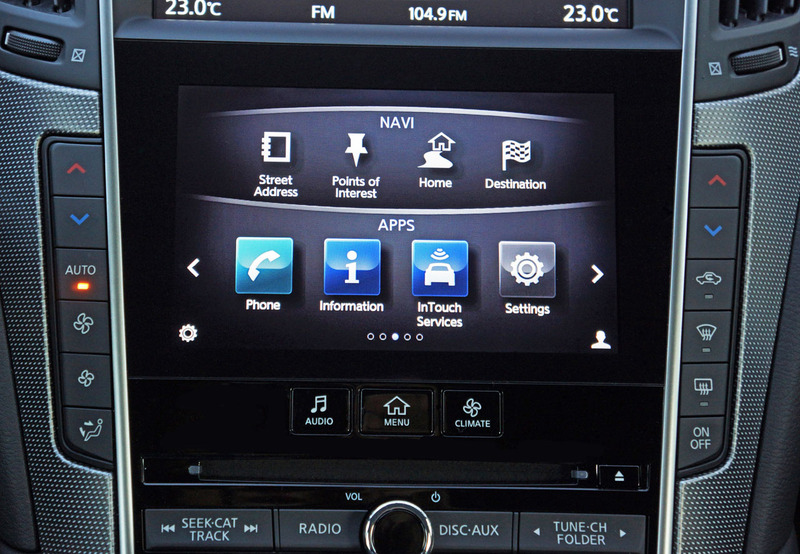 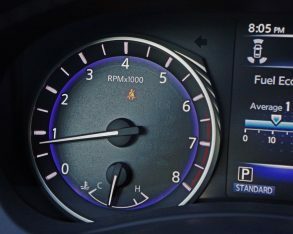 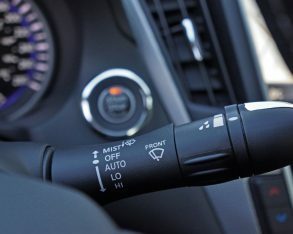 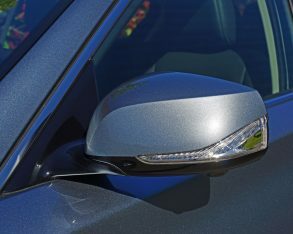 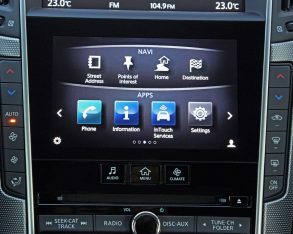 These items include the package’s predictive forward collision warning and autonomous forward emergency braking, while additional package features include blindspot warning, back-up collision intervention, rain-sensing wipers, and a 360-degree Around View Monitor with moving object detection, plus front and rear parking sensors. 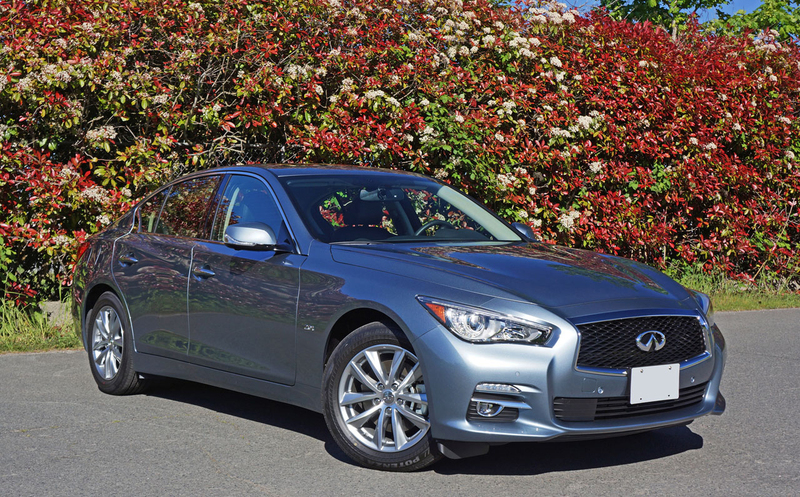 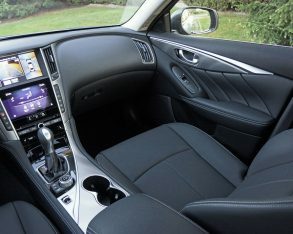 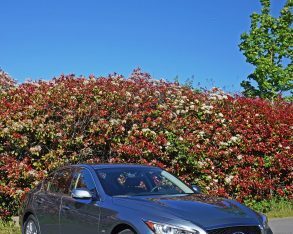 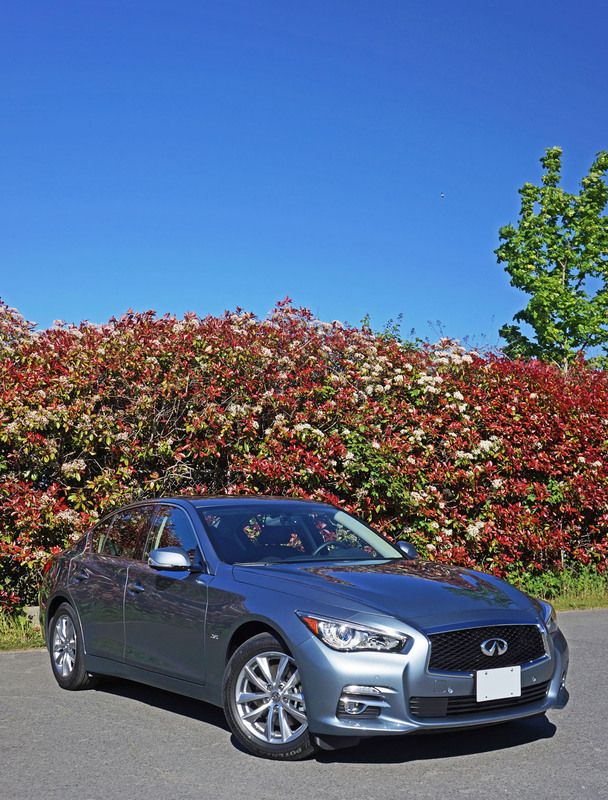 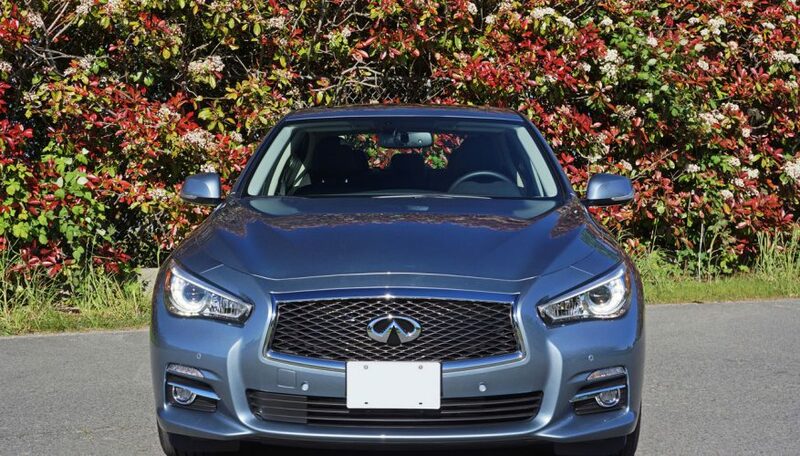 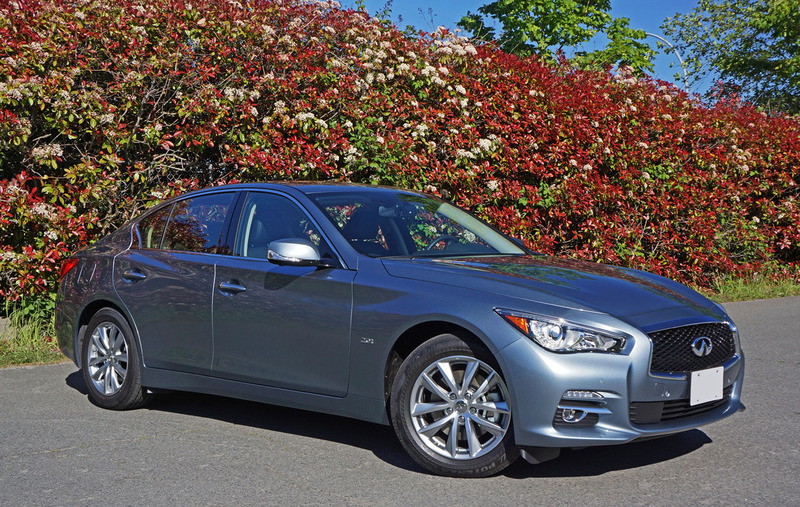 Even so equipped the Q50 2.0t Premium AWD’s $46,185 price is very attractive, capable of keeping the monthly payment low while also likely helping it retain more value when trade-in time arrives. 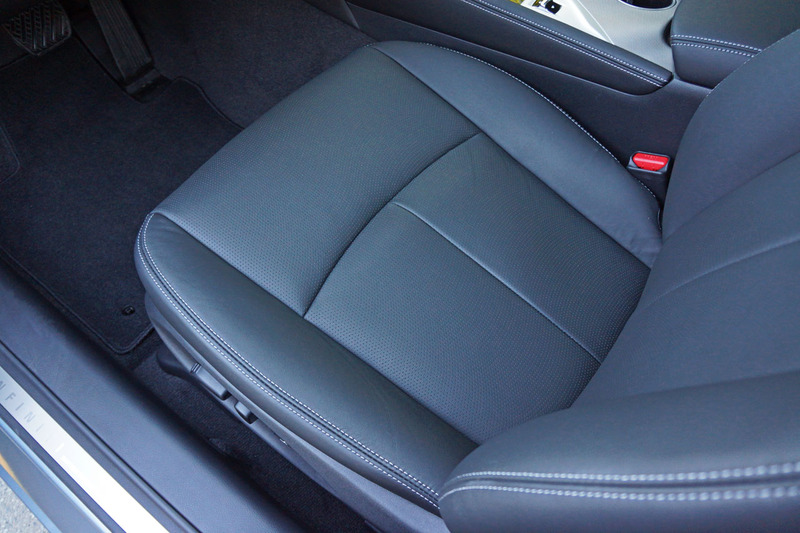 of my knees when the driver’s seat was set to my five-foot-eight height, with three inches left over my head. 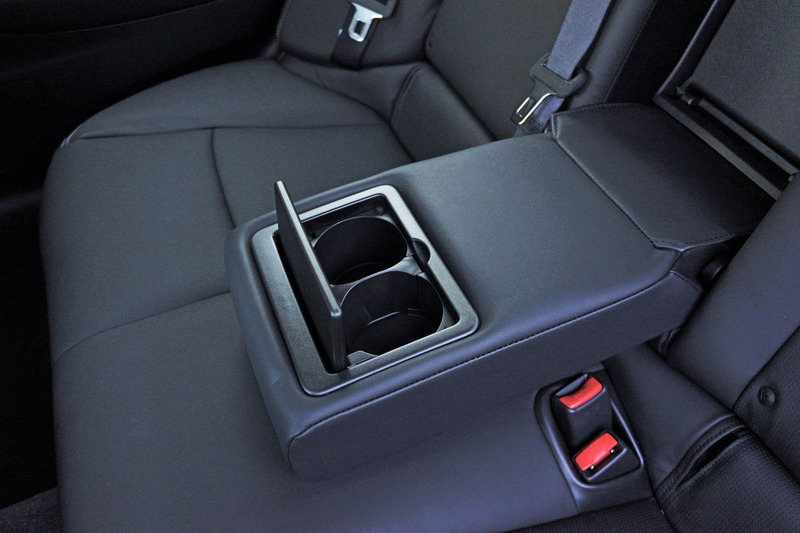 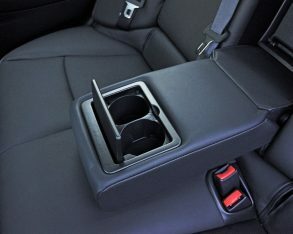 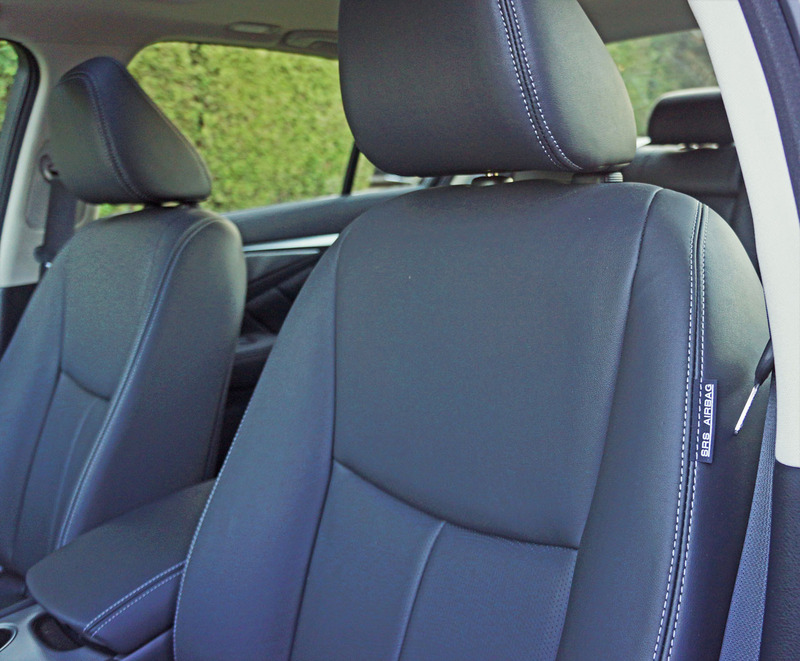 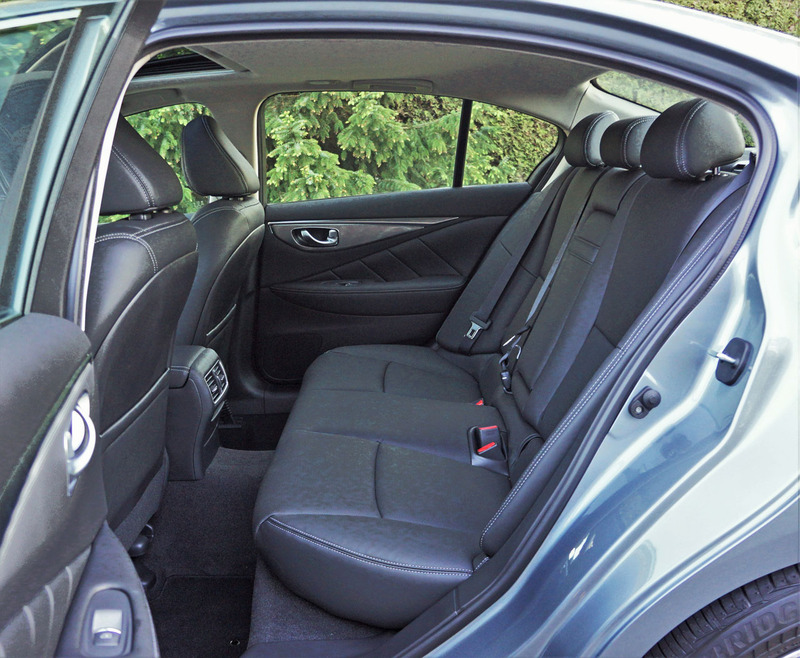 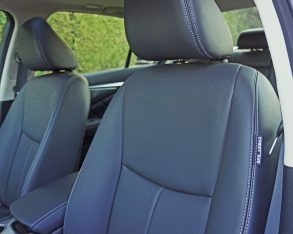 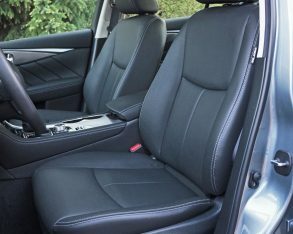 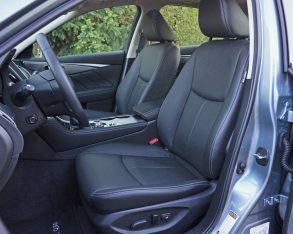 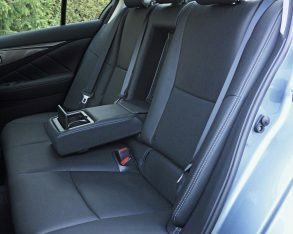 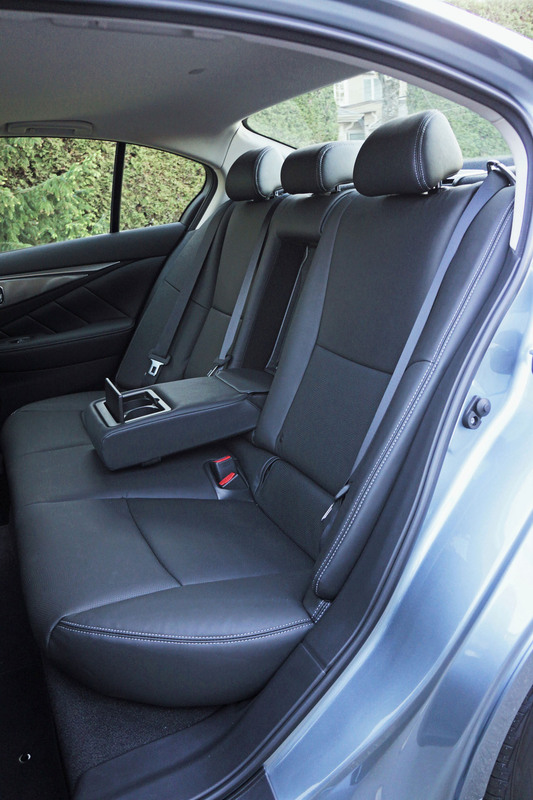 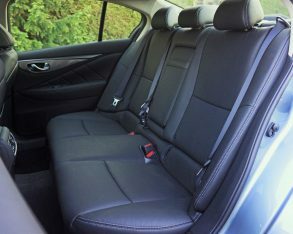 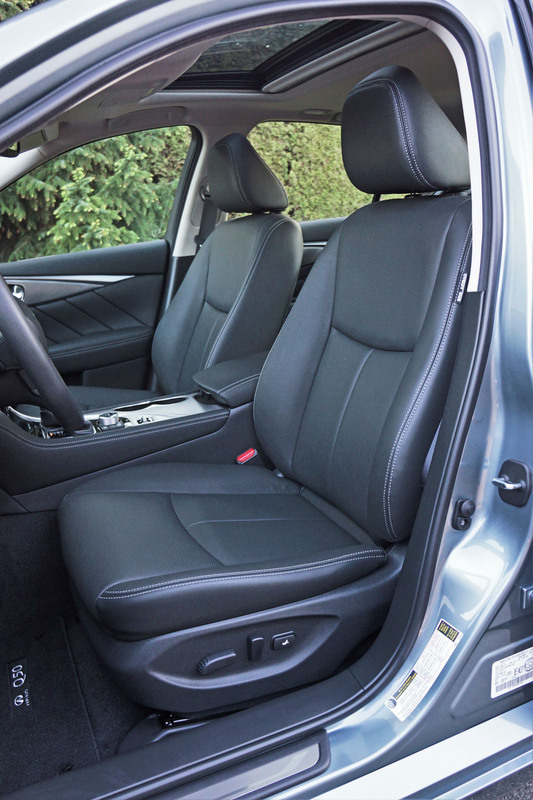 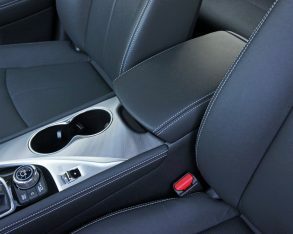 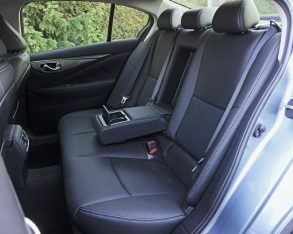 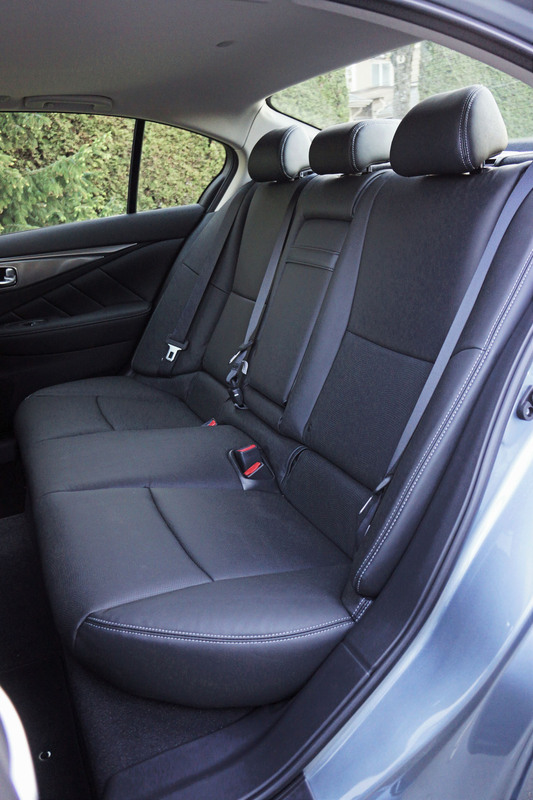 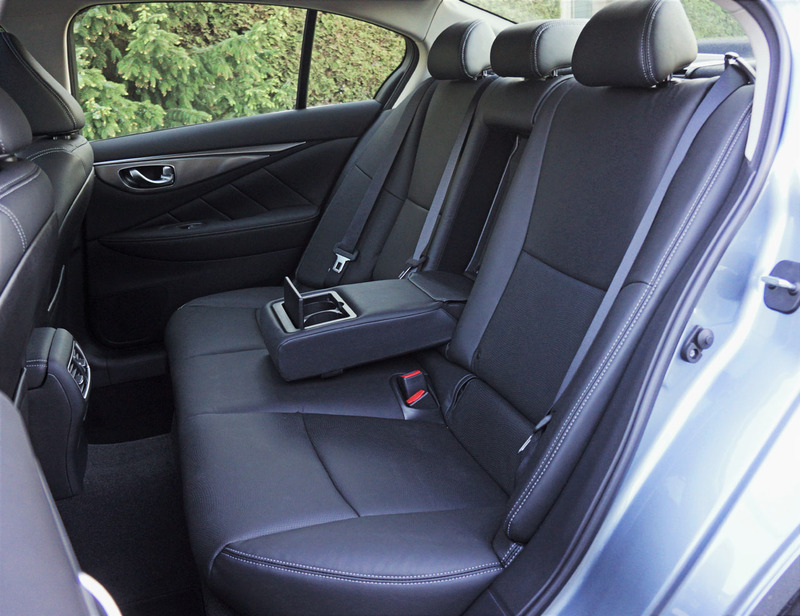 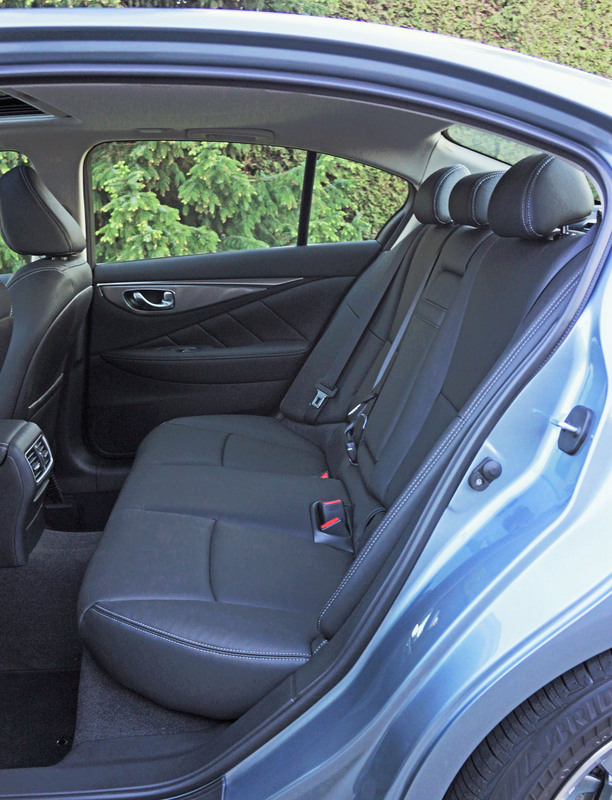 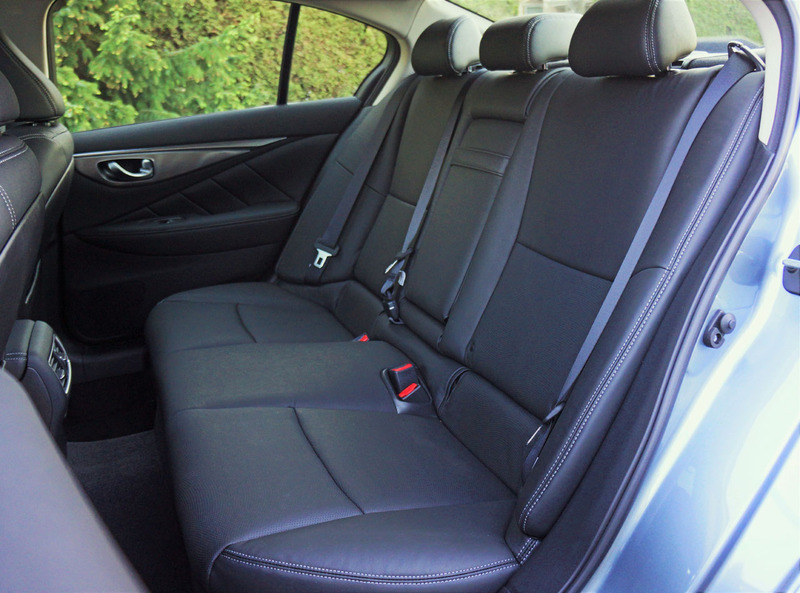 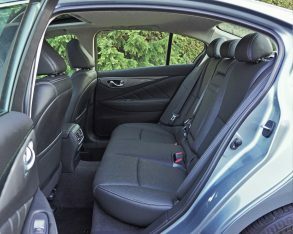 The seat is comfortable with good support, plus an armrest with the usual integrated cupholders folds down at centre. 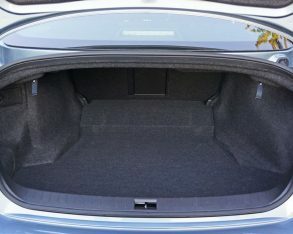 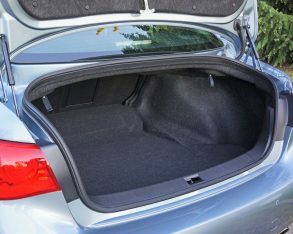 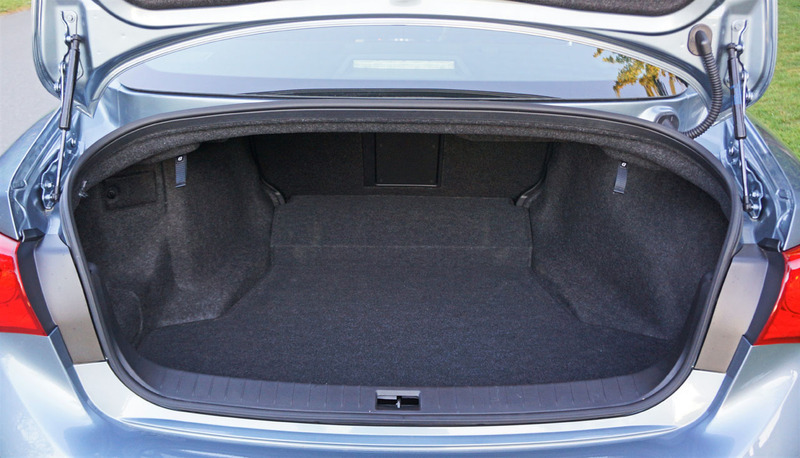 The trunk’s 374-litre (13.2 cubic-foot) capacity isn’t the largest in this segment, but a centre pass-through and a 60/40-split make it expandable, so therefore it offers advantages when trying to optimize passenger and cargo space. 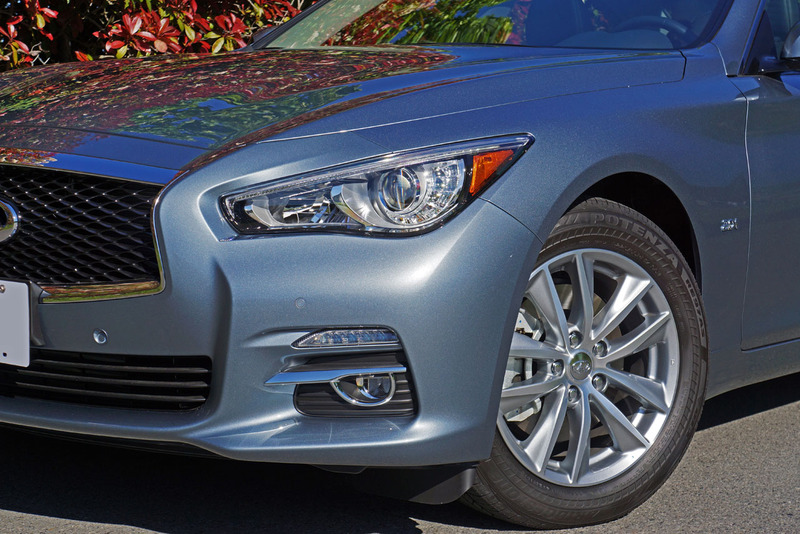 In summary, the new Q50 2.0t AWD isn’t perfect but it’s a solid entry-level luxury sedan in a very crowded, highly competitive field. 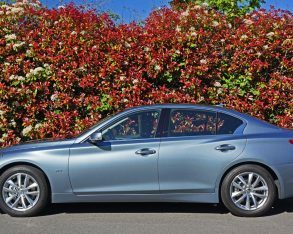 Its performance is stronger than a base 3 Series and should easily satisfy bargain focused D-segment buyers, while the car’s optional powertrains are very impressive, especially when factoring in value for money spent. 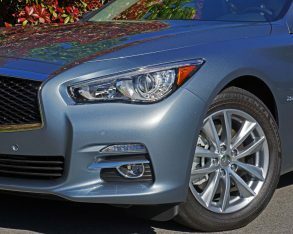 All-round the Q50 remains a fairly strong seller thanks to that value proposition, and should be considered a worthy alternative if you’re already on the hunt for one of its rivals.